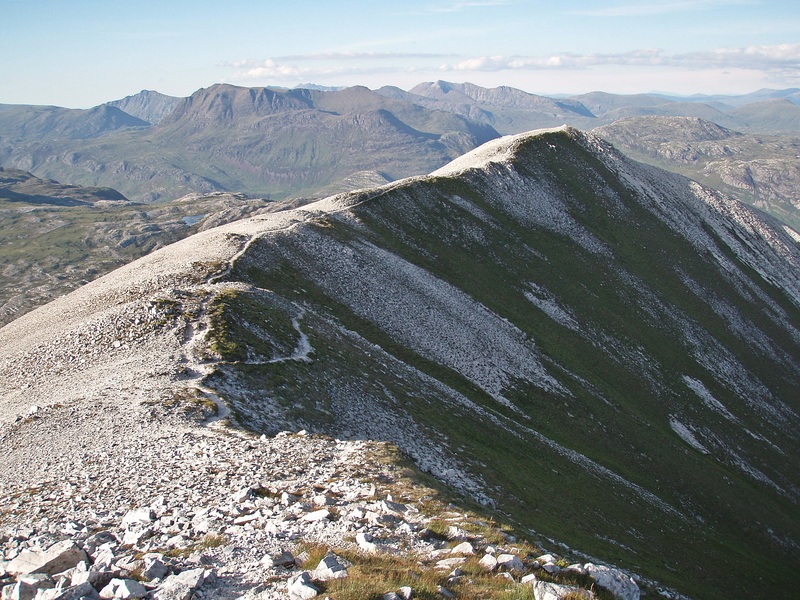 Meall Dearg is supposed to be the most difficult Munro Top on the mainland, and I had been waiting quite a while for an opportunity to climb it. 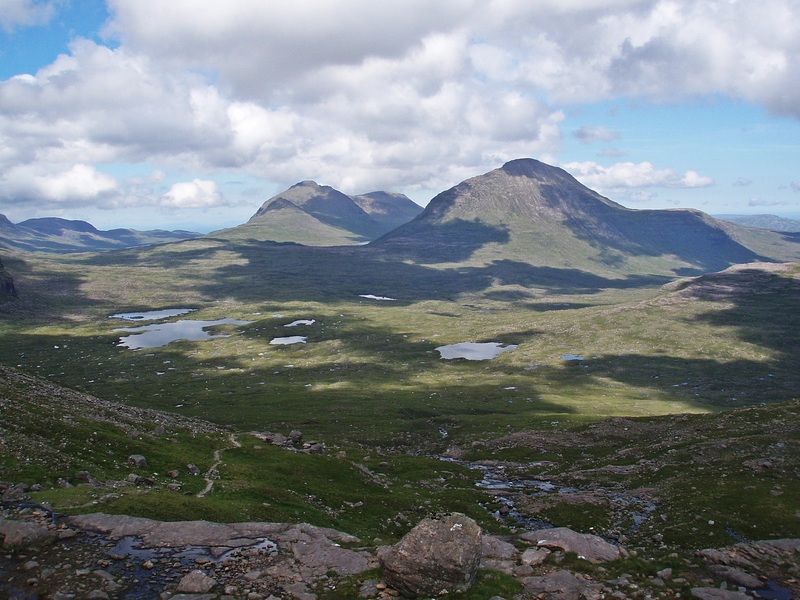 All I needed was a spell of dry weather, with little wind and good visibility, and this week the forecast looked promising. 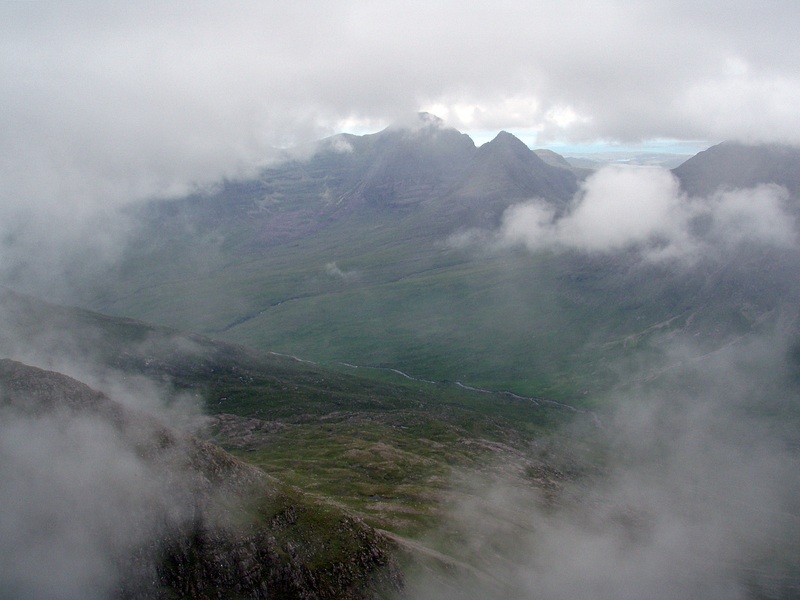 When I approached Liathach on the road from Kinlochewe, the ridge was under cloud, but at this point I was optimistic that the clouds would soon lift. 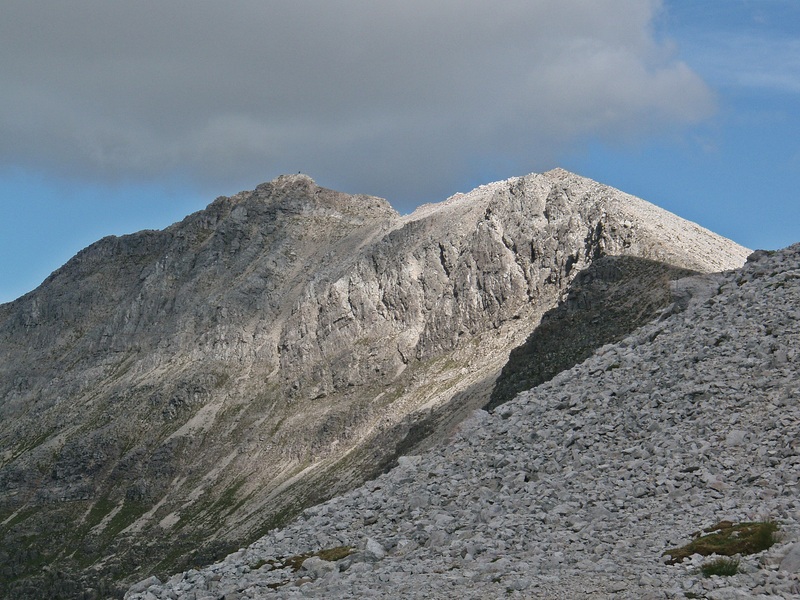 I parked in the car park opposite the Ling Hut and headed up into Coire Dubh Mòr at 09:20. 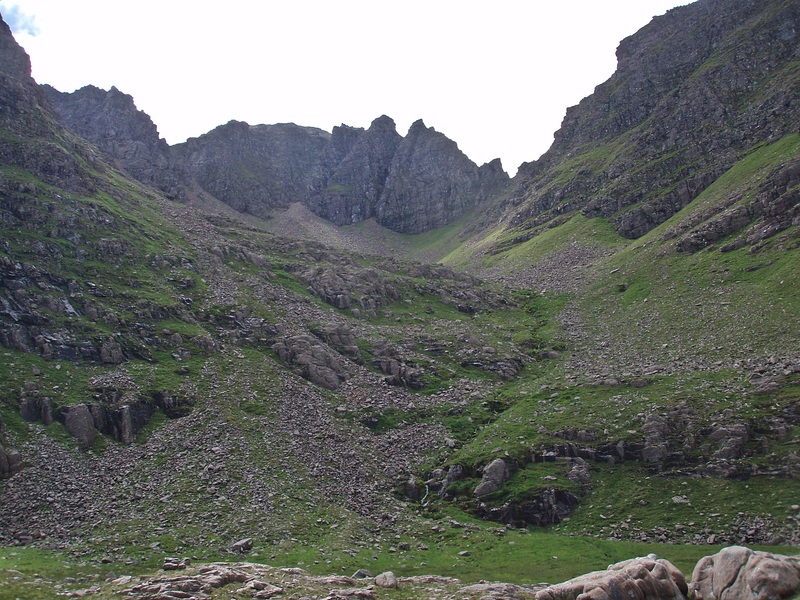 A few years ago I had ascended the ridge from Coire Dubh Mòr via Stùc a’ Choire Dhuibh Bhig, which had been a nice warm-up for the harder scrambling further along the ridge. Today this was my planned return route. 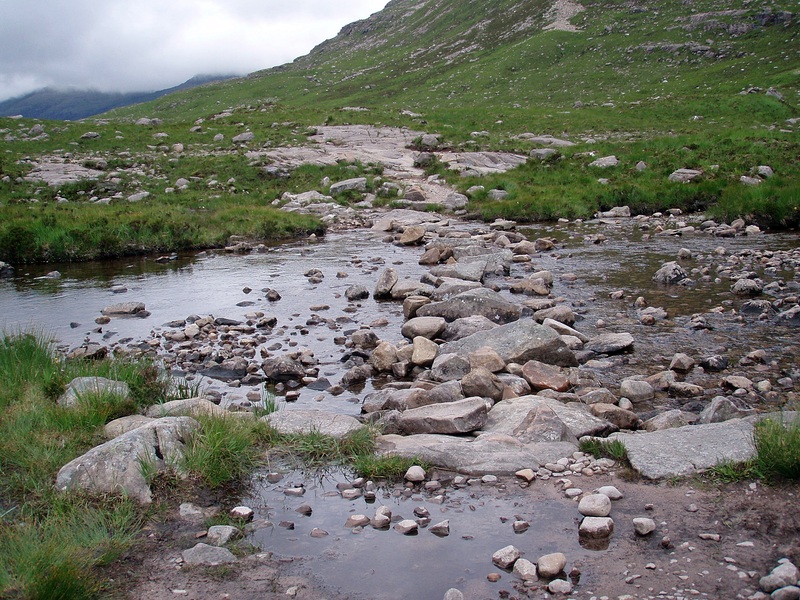 Stepping Stones in Coire Dubh Mòr. At the path junction a bit further up I turned left. 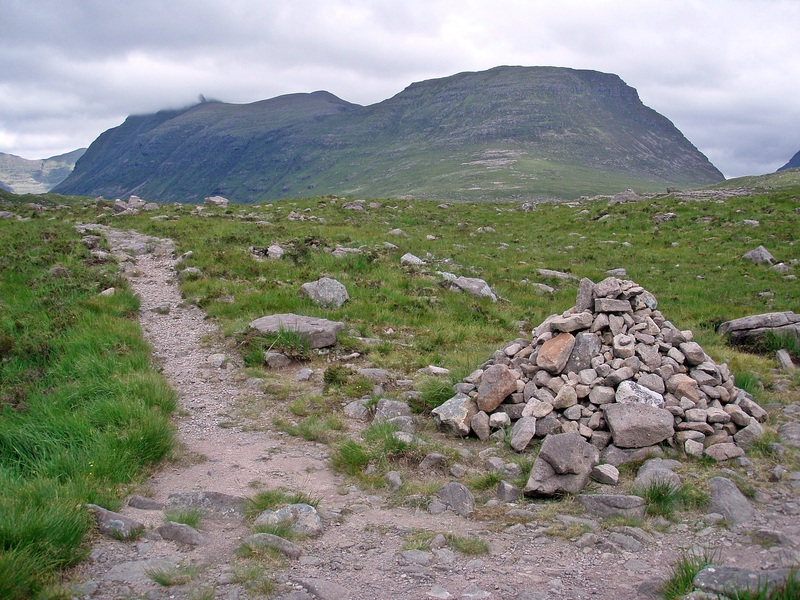 After the first of a chain of lochans I left the path and continued across rough terrain towards Glas-toll Lochain. 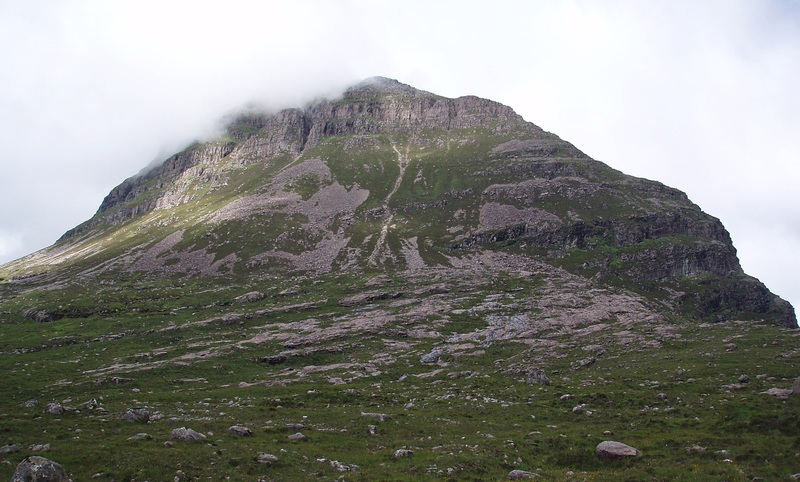 From here the steep crags of Meall Dearg looked impressive, but unfortunately the ridge was still covered in clouds. 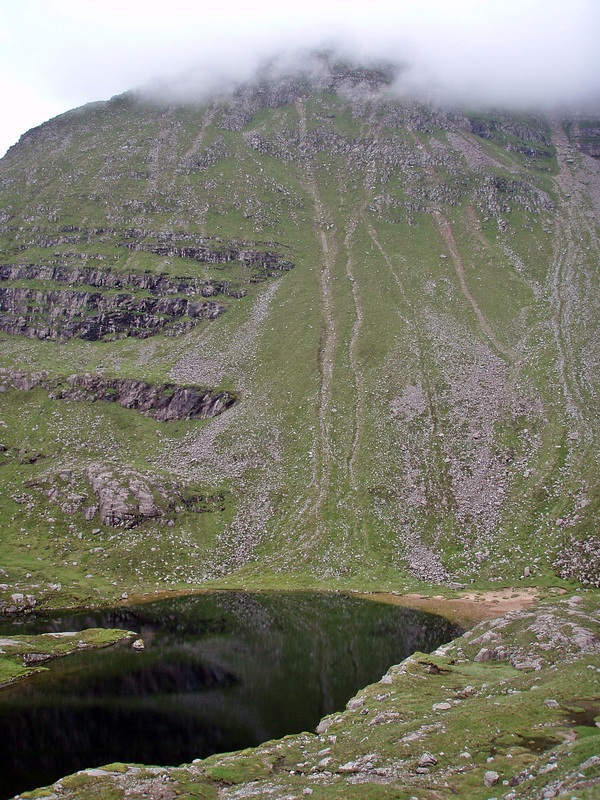 The stepping stones at the outflow of Loch Coire na Caime were slippery and covered with moss, but using my trekking poles for balance I managed to get across with dry feet. 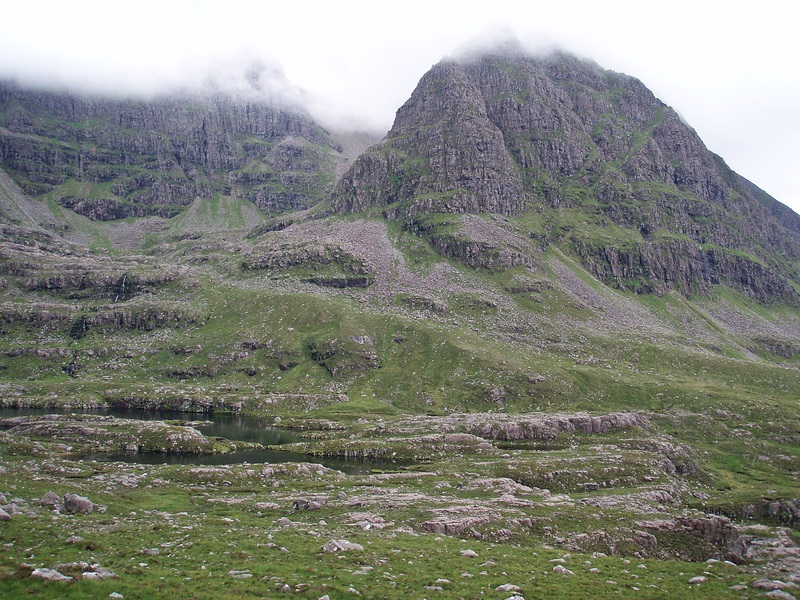 Spidean a’ Choire Lèith towering above the loch. 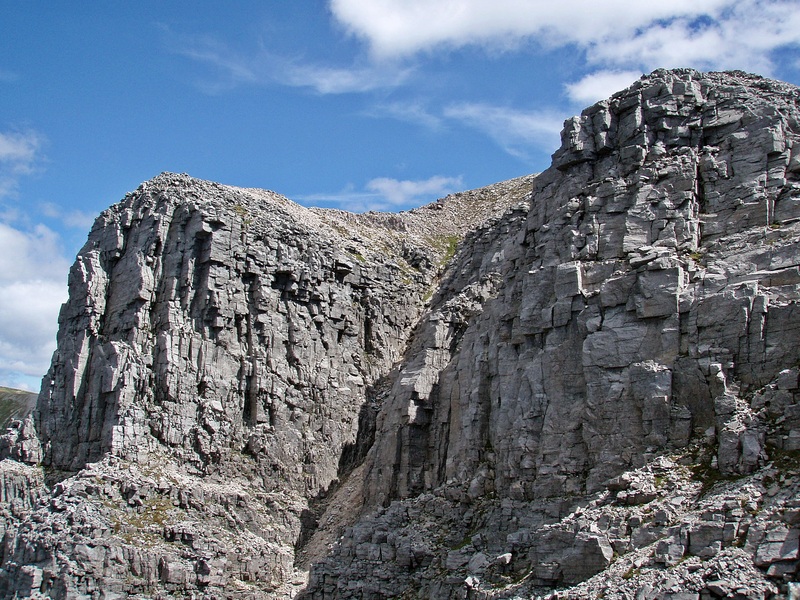 Rock formations in Coire na Caime. 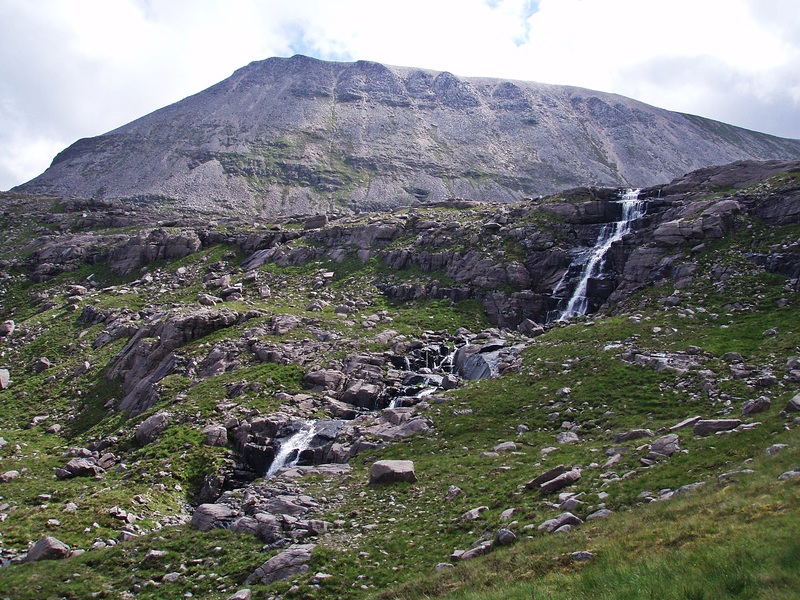 Coire na Caime has got several tiers, and the easiest way up is to follow the stream flowing down from Coireag Chàm. 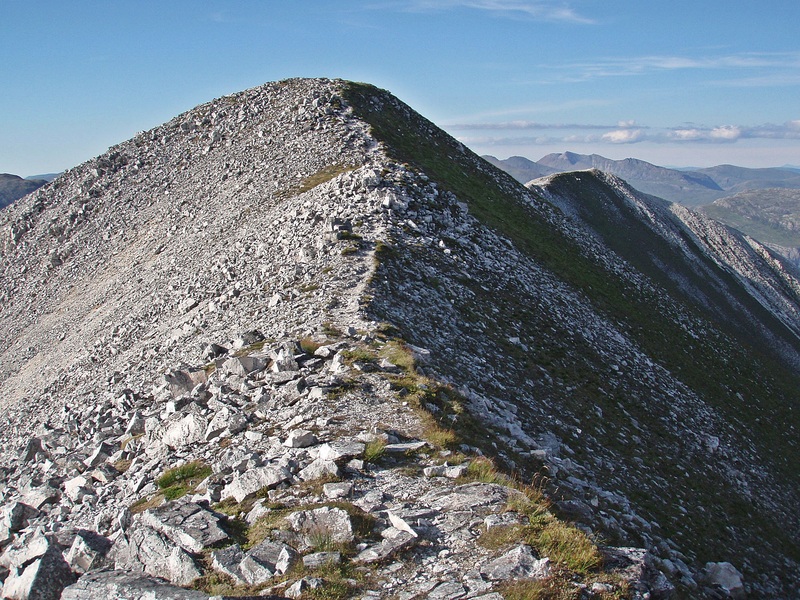 Coireag Chàm – the grassy/stony slope on the right is the ascent route to the ridge. Higher up the slope steepens. 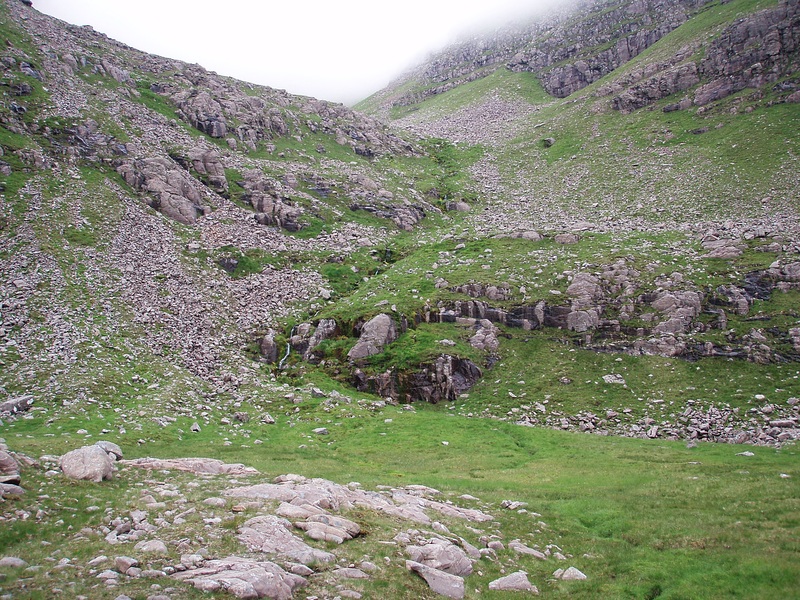 Near the col at the lowest point of the ridge the terrain is very loose and even steeper than before. To find the best way up, I changed from left to right and back again as the other side always looked easier from the distance, but sadly not any more when I got there! 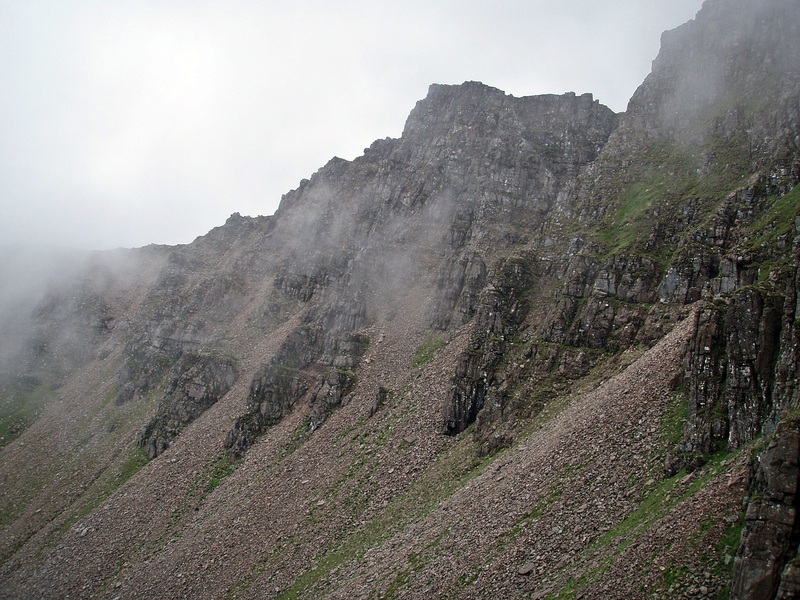 This last section before the ridge took me ages but eventually I arrived at the col which was still enshrouded in clouds. 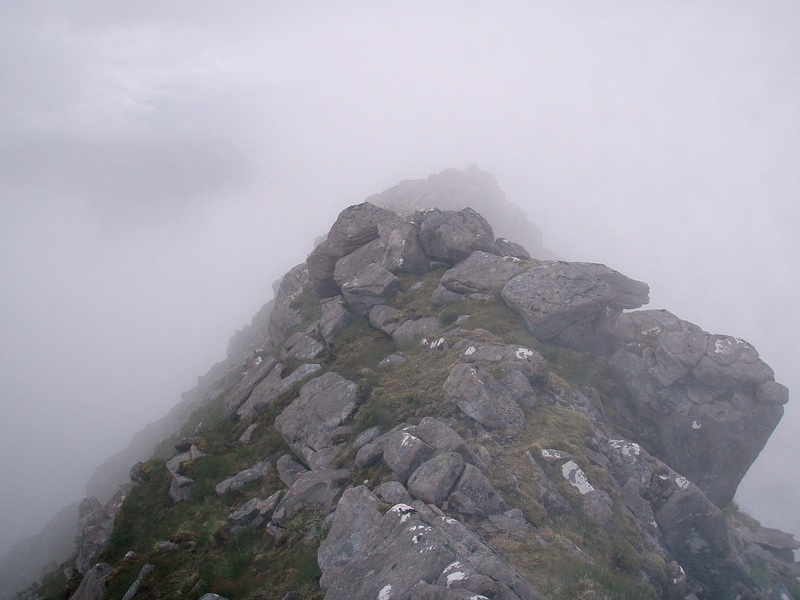 I couldn’t even see the top of Meall Dearg, so I just made my way along the ridge towards it, hoping the summit would be an obvious feature. 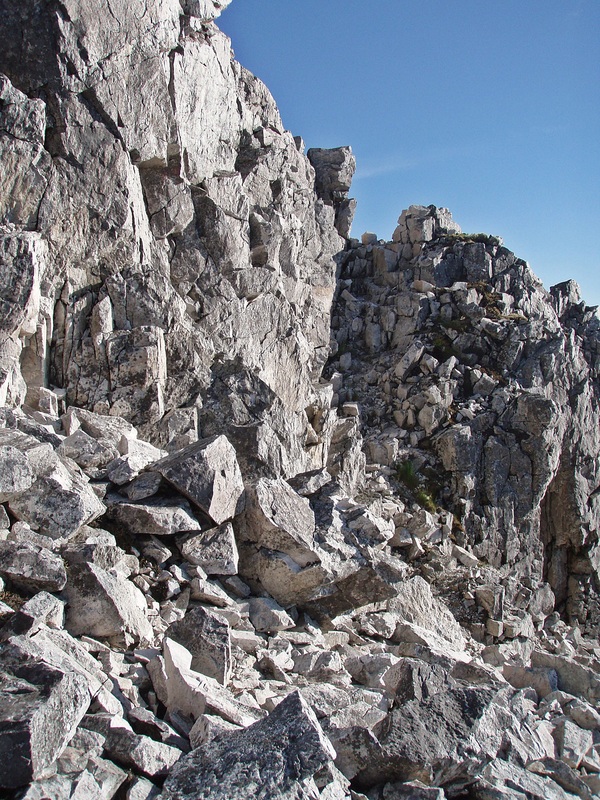 The scrambling along the ridge wasn’t difficult, I just took my time and tried every hold first because the rocks were very loose, but I found it slightly unsettling not to know how far I had to go. 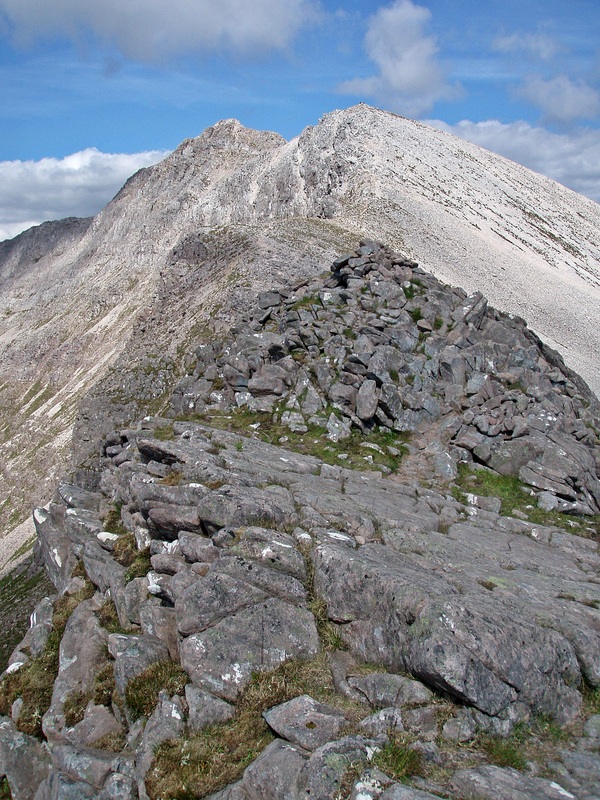 Approaching the summit of Meall Dearg. 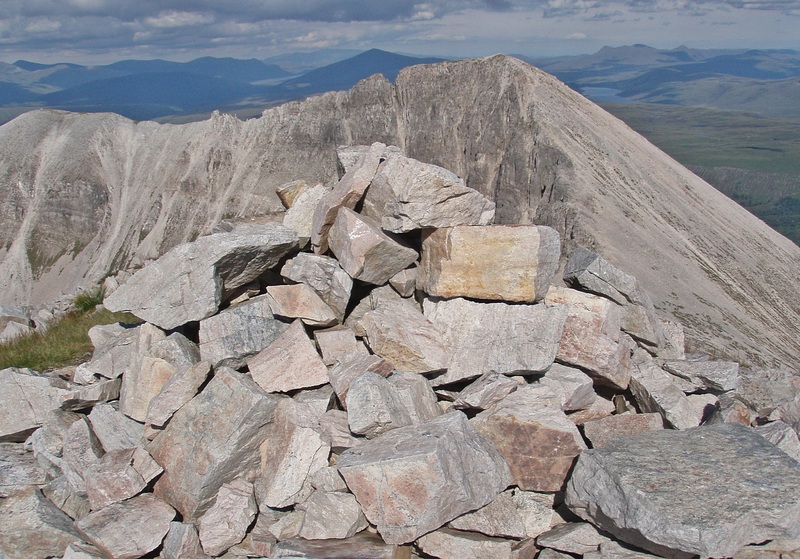 I had made it – now some views would have been nice! 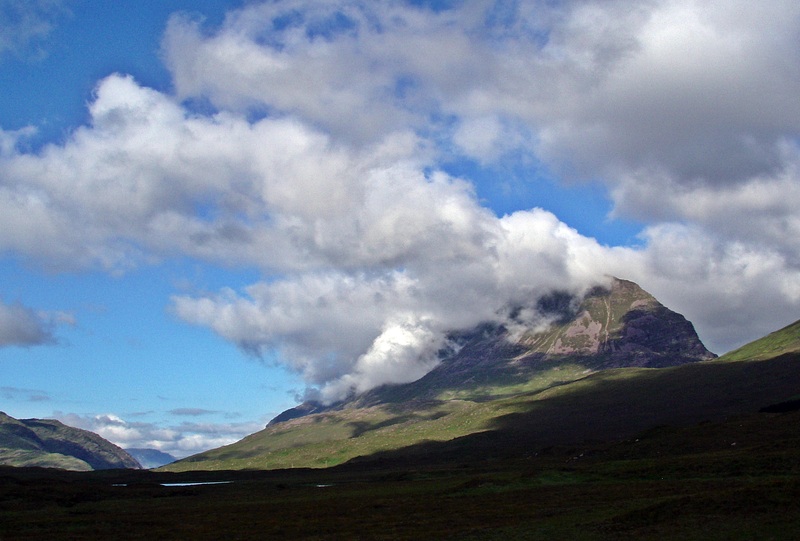 And as it happens, suddenly the clouds lifted and I got a glimpse of Beinn Alligin, but it only lasted a few seconds and then my surroundings were covered again. 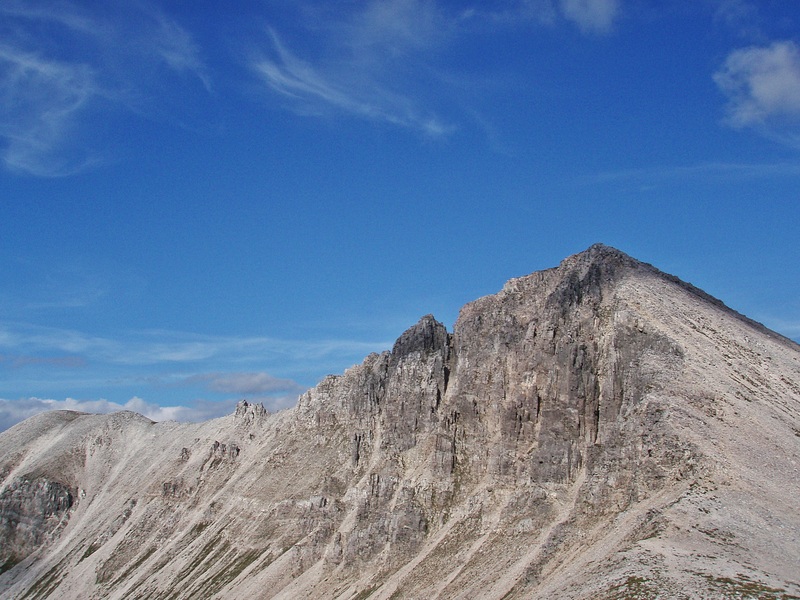 By now it was 14:15 and I had already resigned to the fact that I wouldn’t have enough time to do the whole ridge. 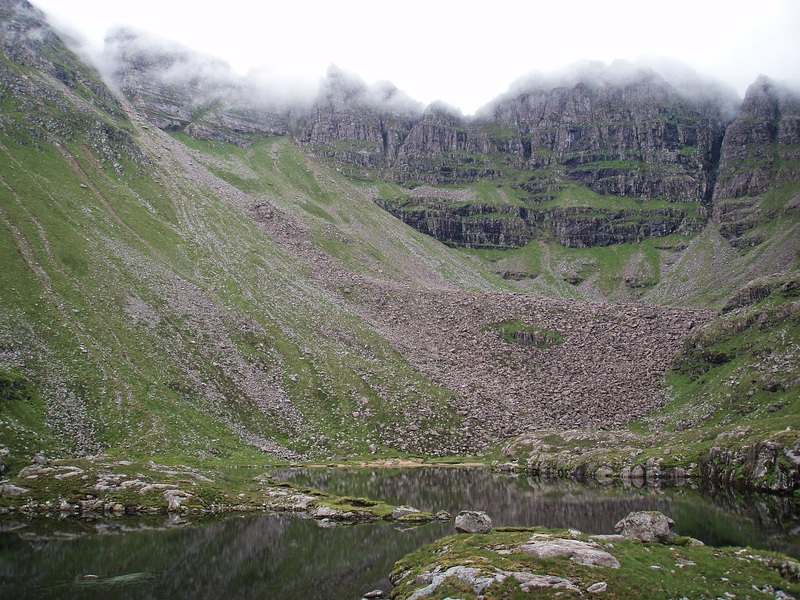 I would have to return via Coire na Caime and come back another time. 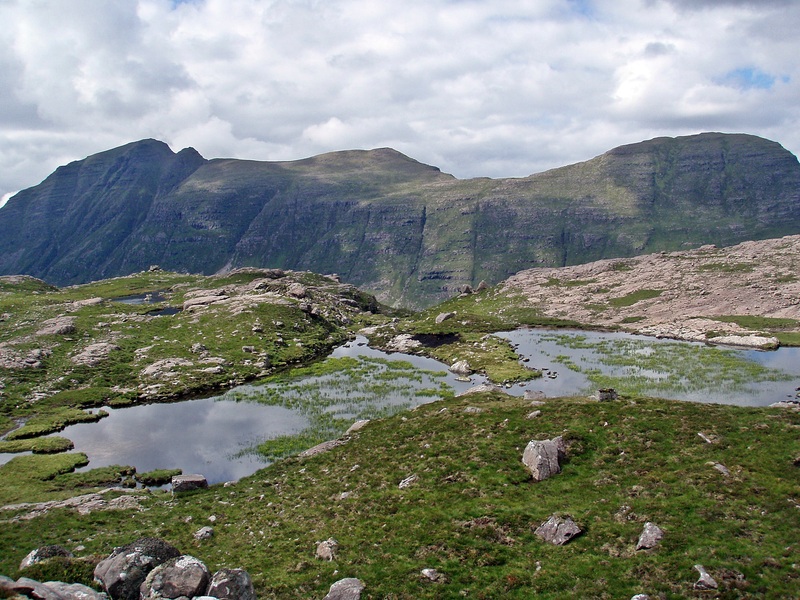 For the Munro Tops I have set myself the (rather puristic) rule to do the Tops together with the respective Munro, on the same day. 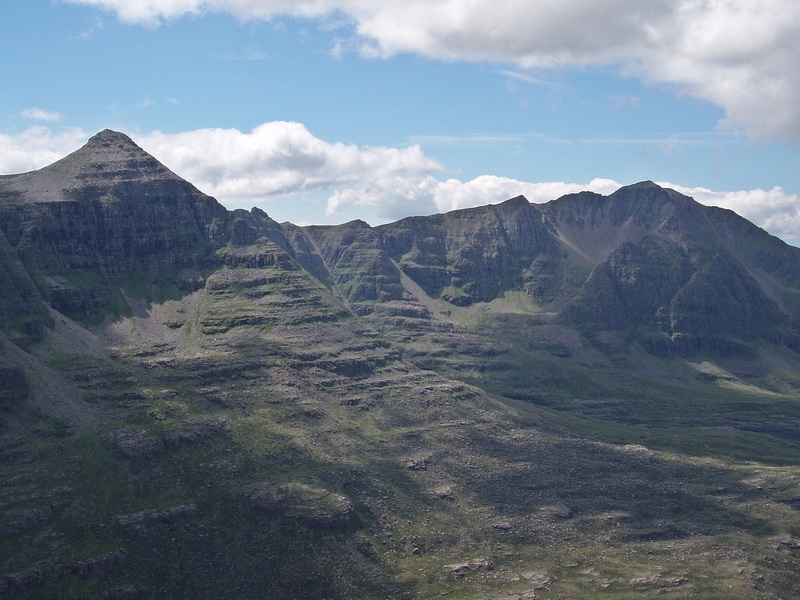 That means I’ll have to climb Meall Dearg again – but I think next time I will try a different route because the one around the back of Liathach takes too long. 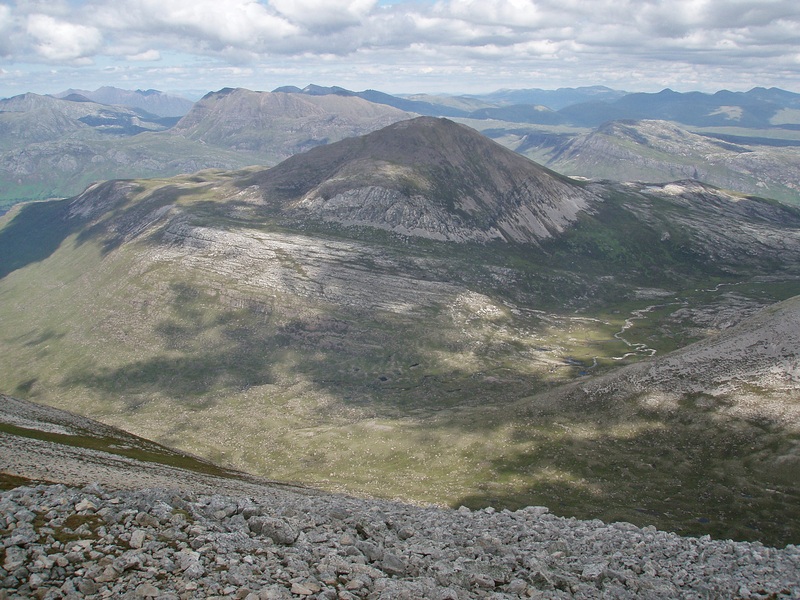 I will probably do the ridge from W to E like I had planned today, but climb Meall Dearg as an “out-and-back” from Mullach an Rathain, via Glas-Toll a’ Bothain. 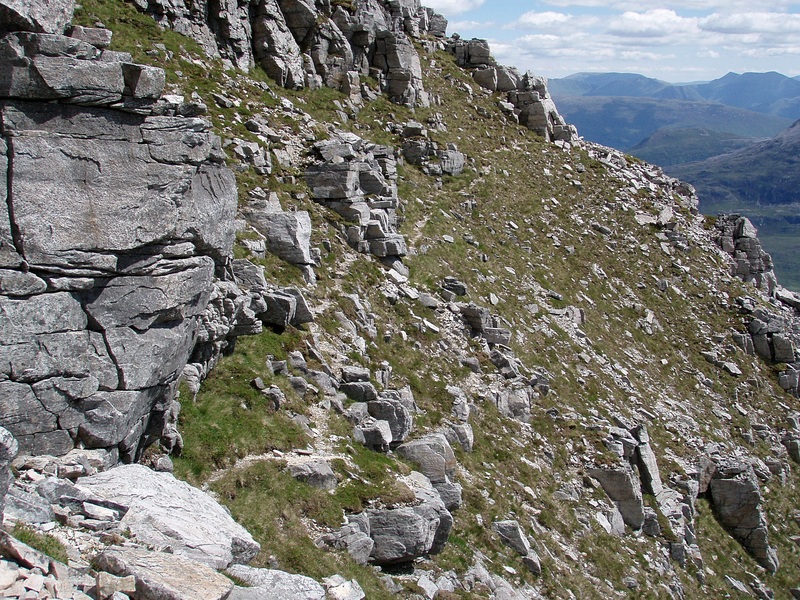 It would be interesting to find out how this route compares to the one I did today. 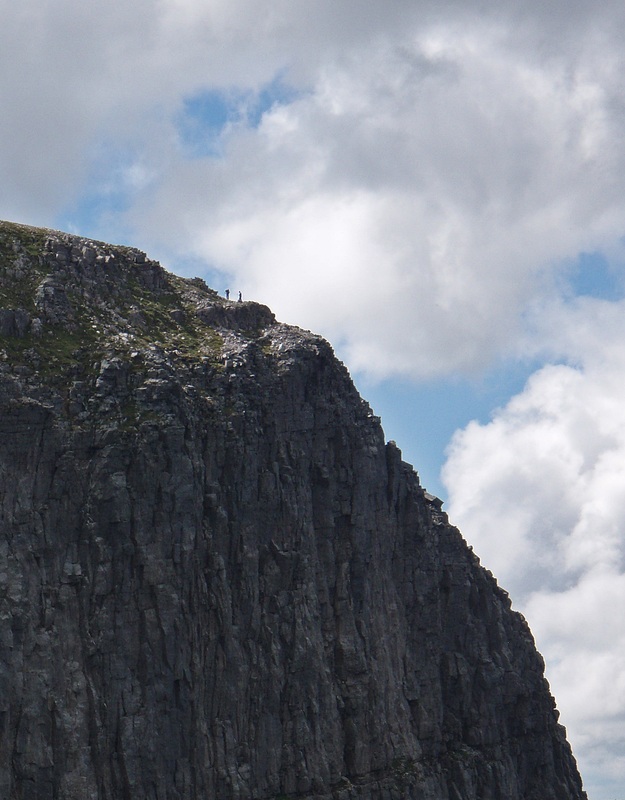 Northern Pinnacles, as seen on my way back to the col. 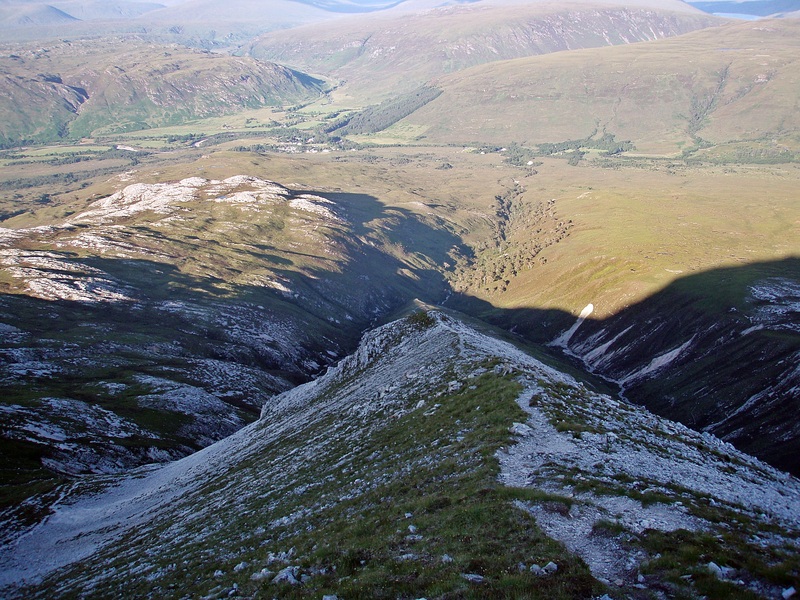 When I passed this steep grassy gully on the NW side of the col I was wondering if this was the way down into Glas-Toll a’ Bothain? 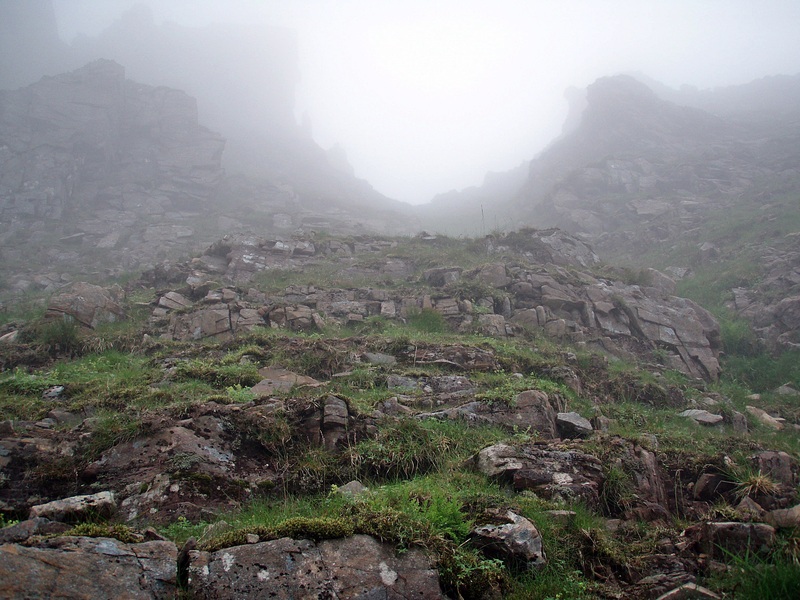 While I retraced my steps into Coireag Chàm, again very slowly and carefully as it seemed even trickier in descent, the clouds started to break up. 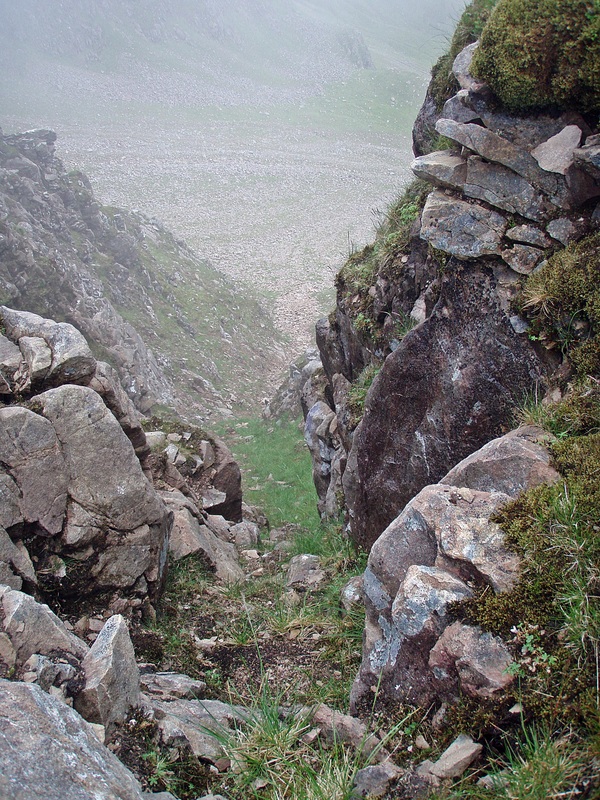 Crags below Mullach an Rathain. 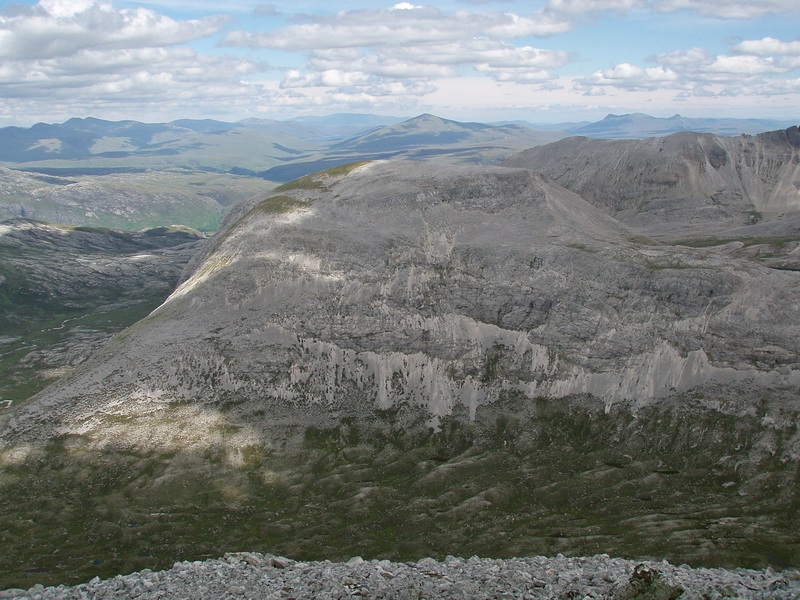 Looking back to the col in the centre of the photo. 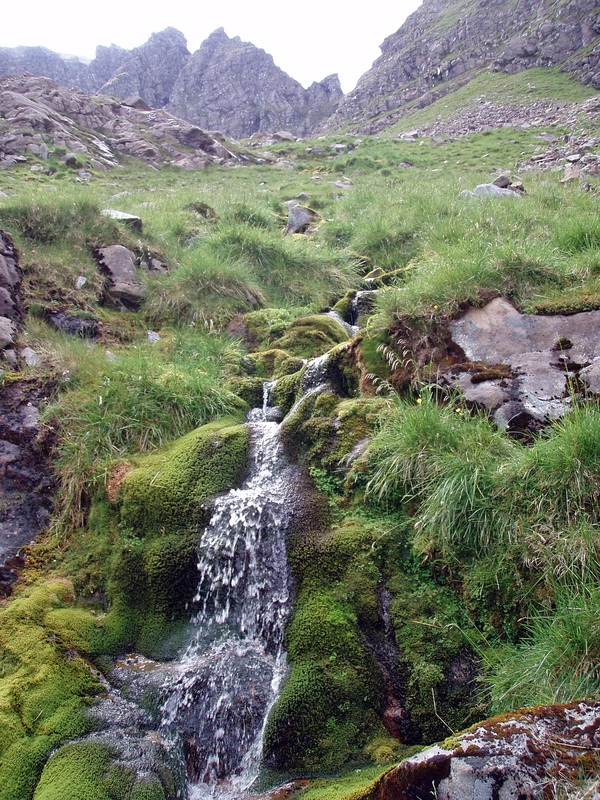 Unnamed stream flowing into Coire na Caime. 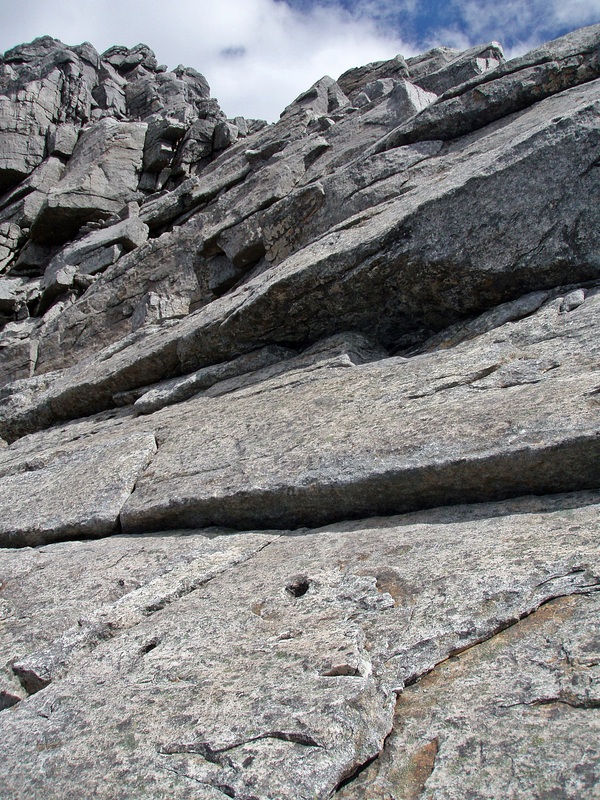 Buttress N of Am Fasarinen. 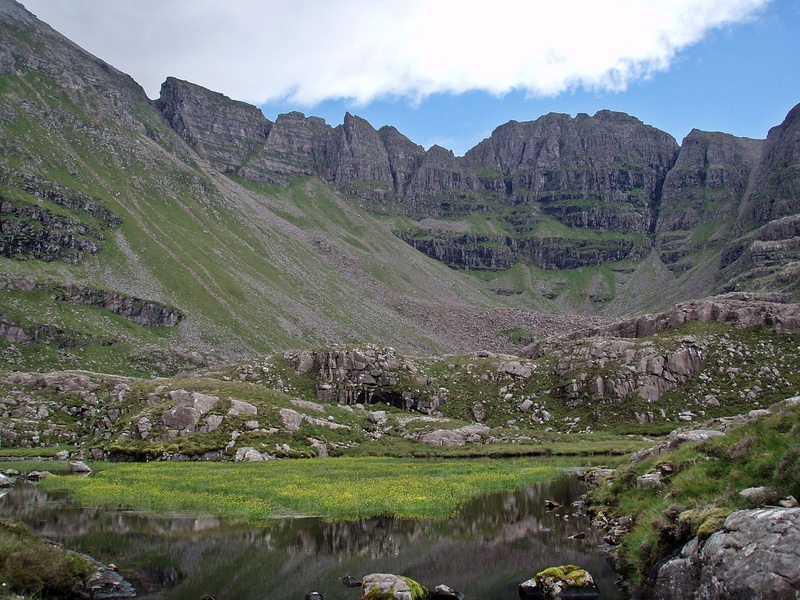 By the time I reached Loch Coire na Caime, the cloud level was above all the hills and it became increasingly sunny and warm. 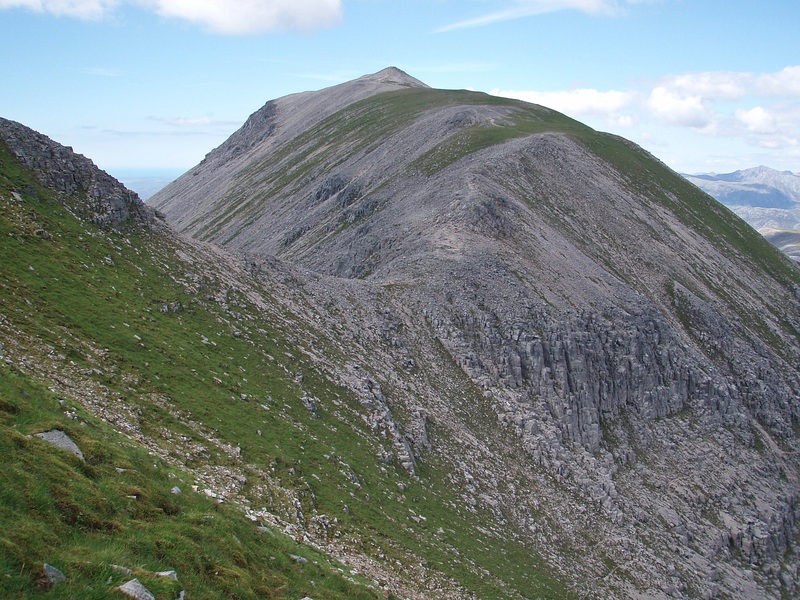 Carn na Feòla (Beinn Dearg), Beinn Àirigh Charr and Beinn a’ Chearcaill. 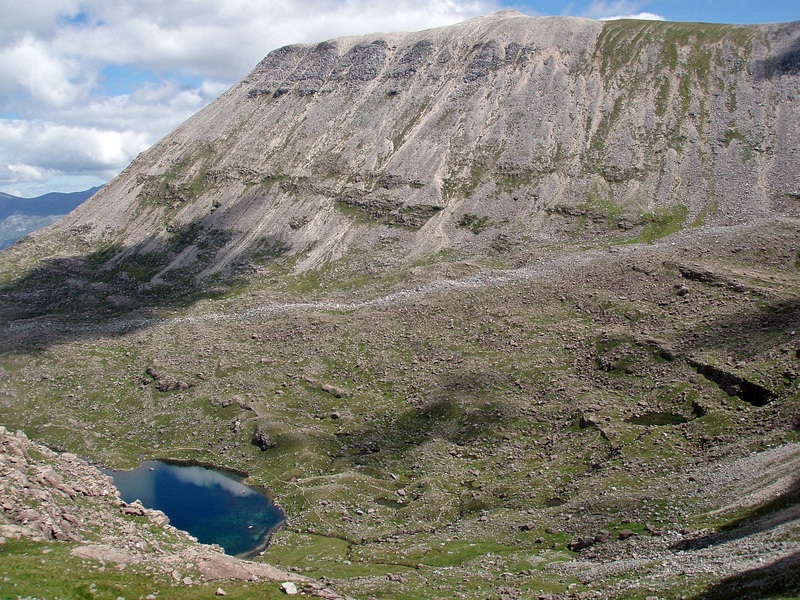 Loch Coire na Caime, with Beinn Eighe in the background. 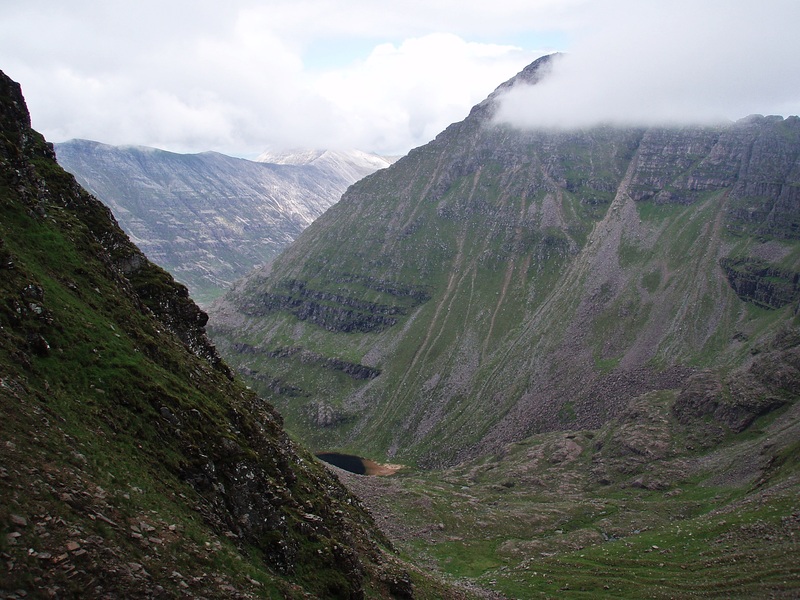 To vary the return route a bit I walked in a more northerly direction to rejoin the path W of Loch Grobaig. 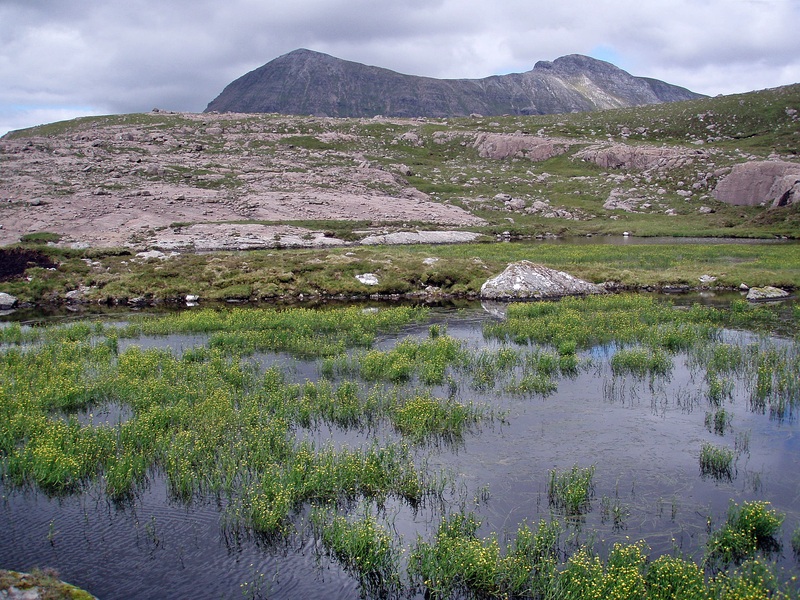 Loch a’ Ghlas-tuill with Beinn Dearg as a backdrop. 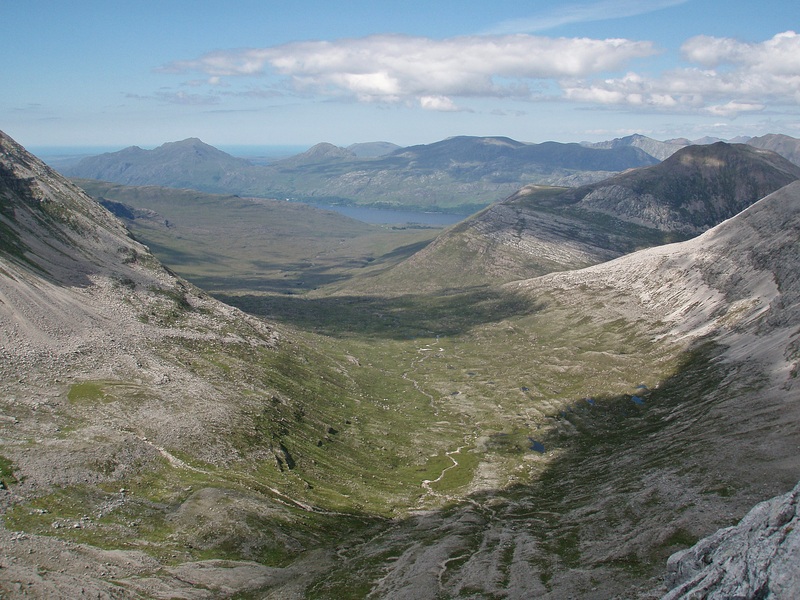 Loch a’ Ghlas-tuill and Beinn Eighe. 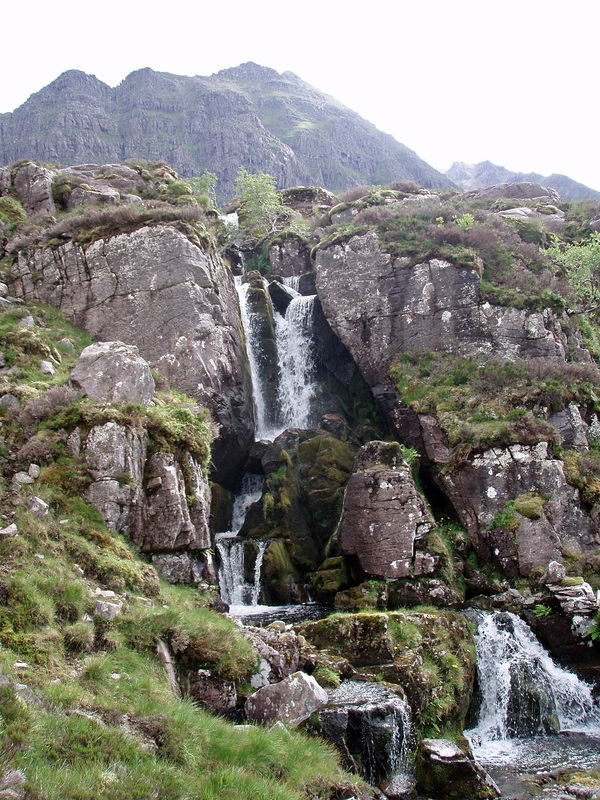 Waterfall below Loch a’ Ghlas-tuill. 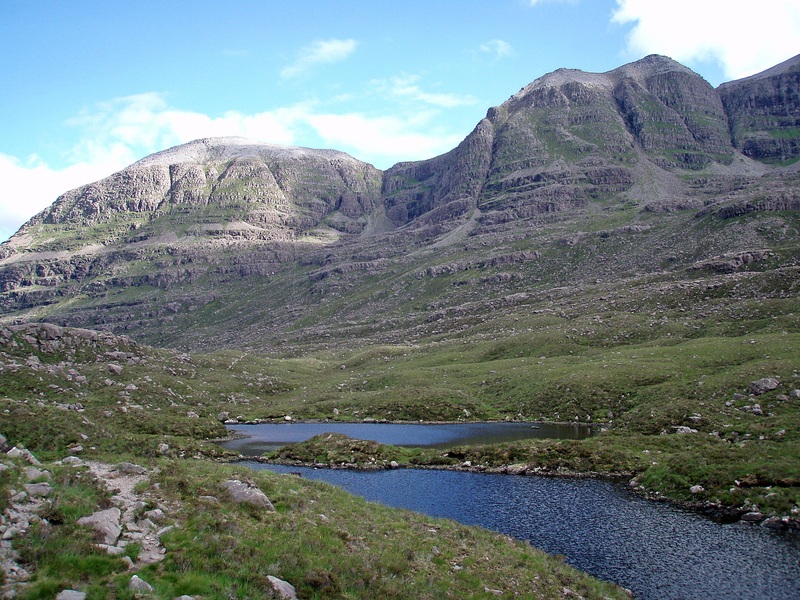 Sgùrr Dubh and Sgorr nan Lochan Uaine on the other side of Glen Torridon. 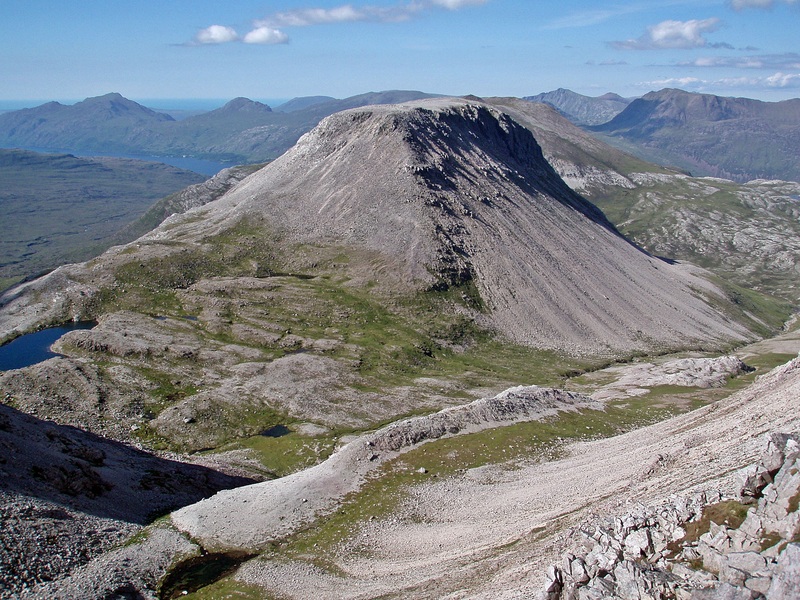 I got back to my car shortly before 19:00 and drove around Loch Torridon to Shieldaig to stay at the campsite for two nights. 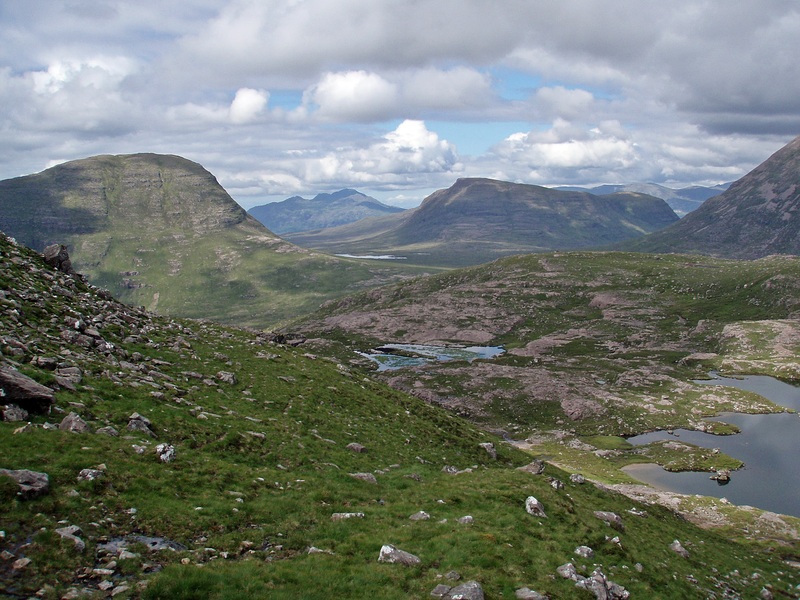 The campsite in Torridon would have been closer but it is very sheltered and I expected it to be midge-infested, whereas the one in Shieldaig is situated above the village and I was hoping it would be breezy up there. 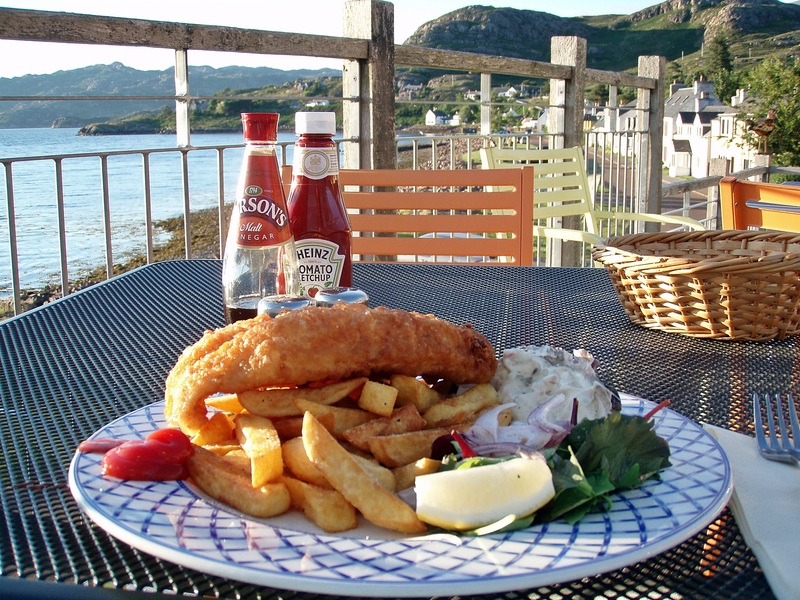 Besides, I wanted to try the Tigh an Eilean Hotel for a bar meal. 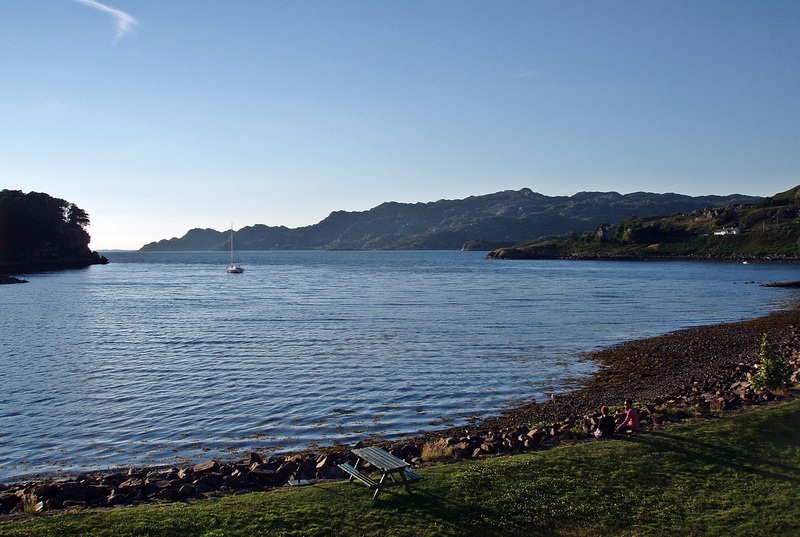 It was such a lovely, warm evening that I could have my dinner on the roof terrace of the Coastal Kitchen which is the more casual part of the Tigh an Eilean Hotel. 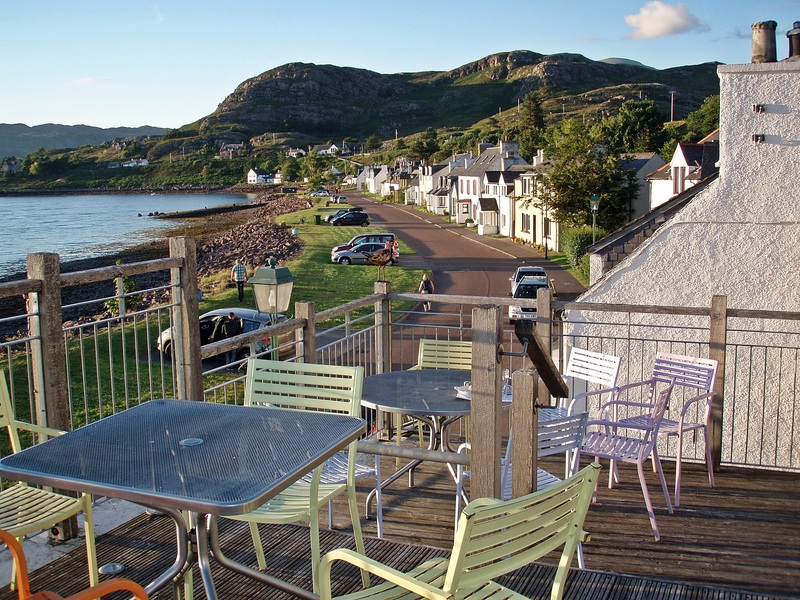 Shieldaig village from the roof terrace. 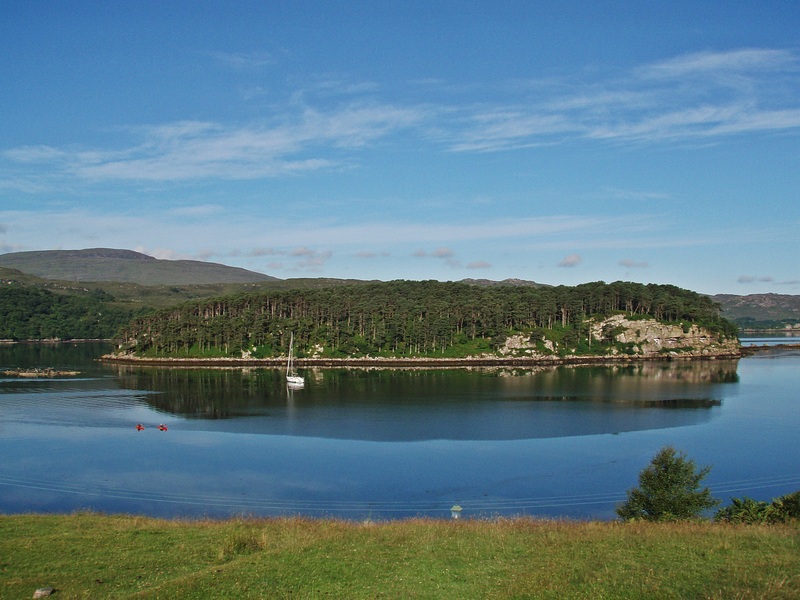 Looking across to Shieldaig Island from the campsite, the weather looked promising, just as well as I had a long day ahead. I drove back along the road towards Kinlochewe and parked by the bridge across the Allt a’ Chuirn, where I was planning to finish my walk in the evening. I started walking along the road at 09:00 and shortly after passing Cromasaig I heard the first car approaching behind me, and quickly stuck my thumb out. 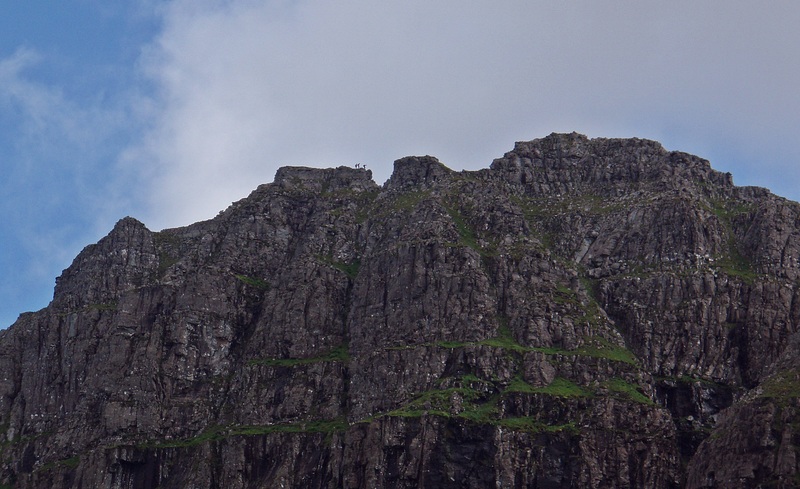 The car stopped and I got a lift by two rock climbers who were on their way to climb a route up the Triple Buttress – a perfect start to the day! 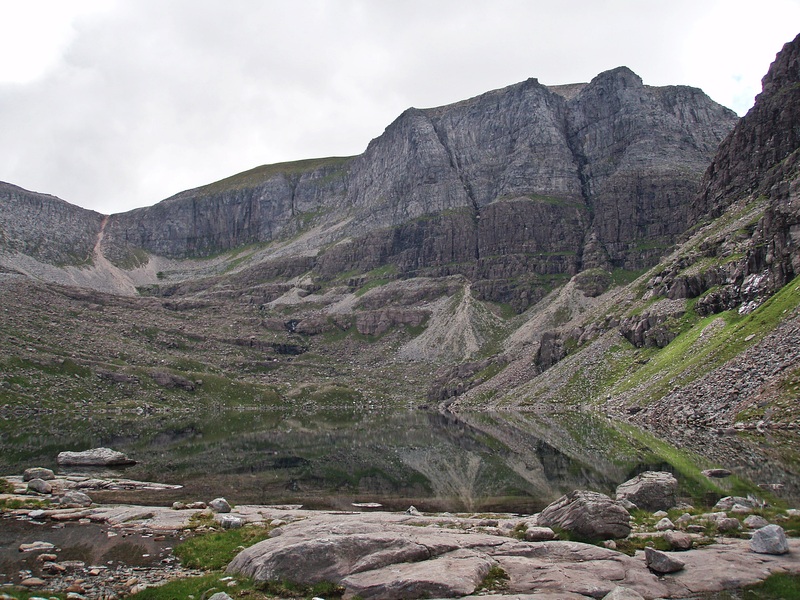 While the climbers got ready at the car park, I started walking up the same path as yesterday, but this time I turned right at the path junction and contoured around Sail Mhòr to reach Loch Coire Mhic Fhearchair. 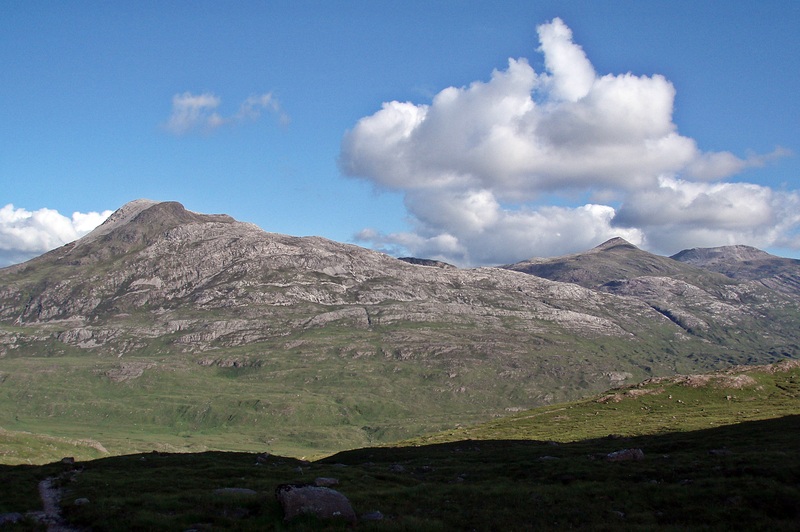 Baosbheinn and Beinn an Eòin. 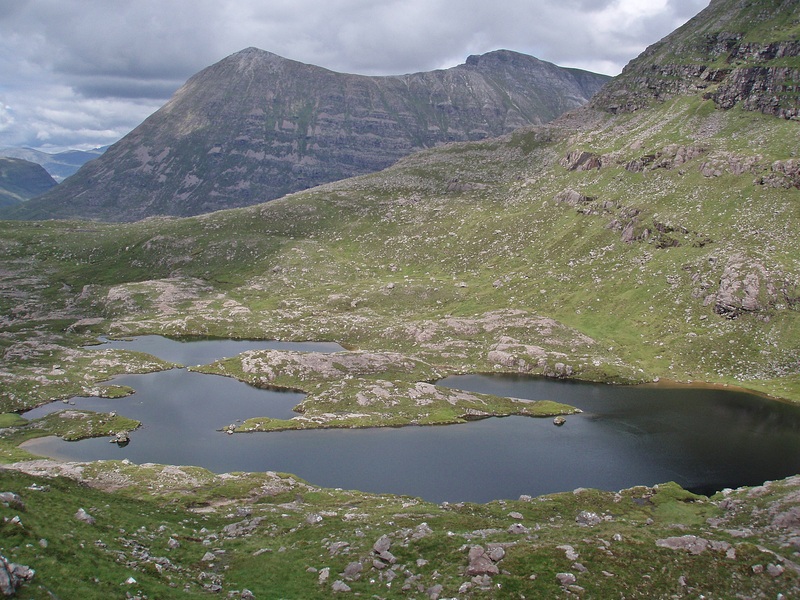 Loch Coire Mhic Fhearchair and the Triple Buttress. 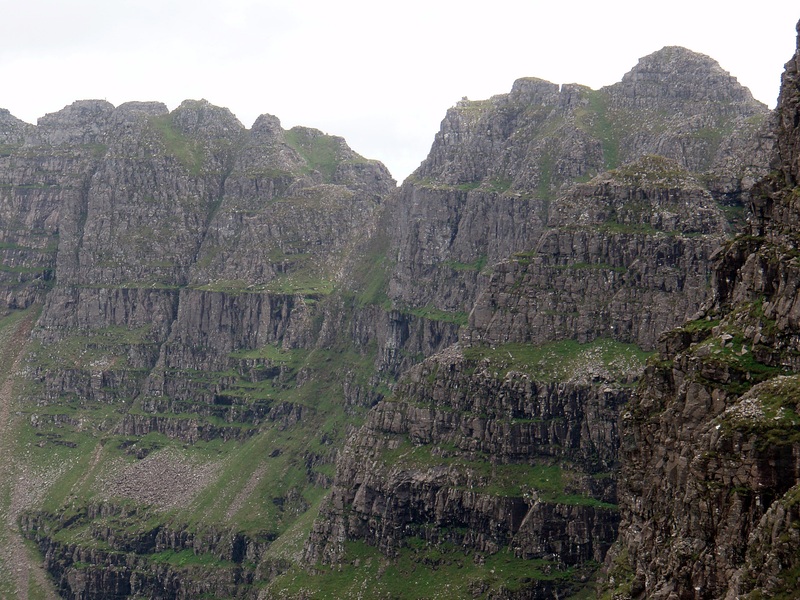 Following a sketchy path around the right hand side of the loch, I got a close-up view of the Triple Buttress. 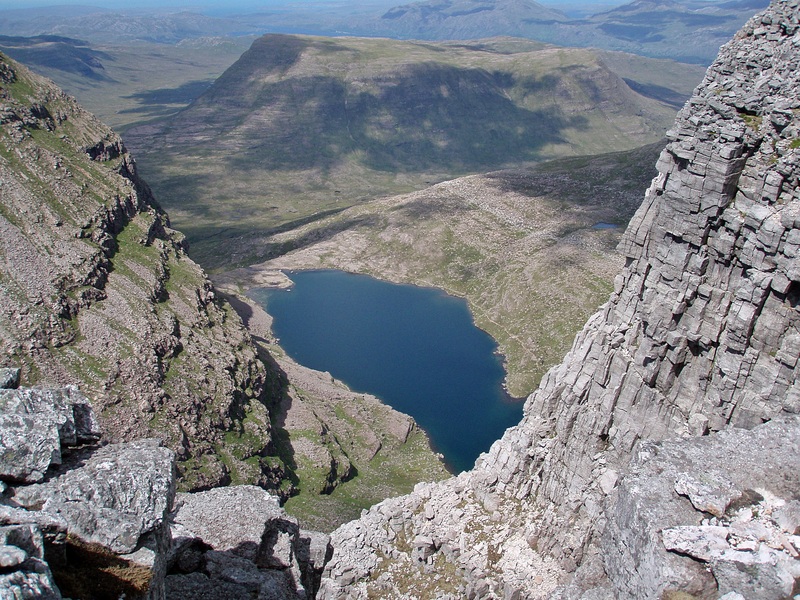 I kept looking out for the two climbers who had overtaken me on the way up to the loch, but I didn’t see them until later in the day when they had finished their route. 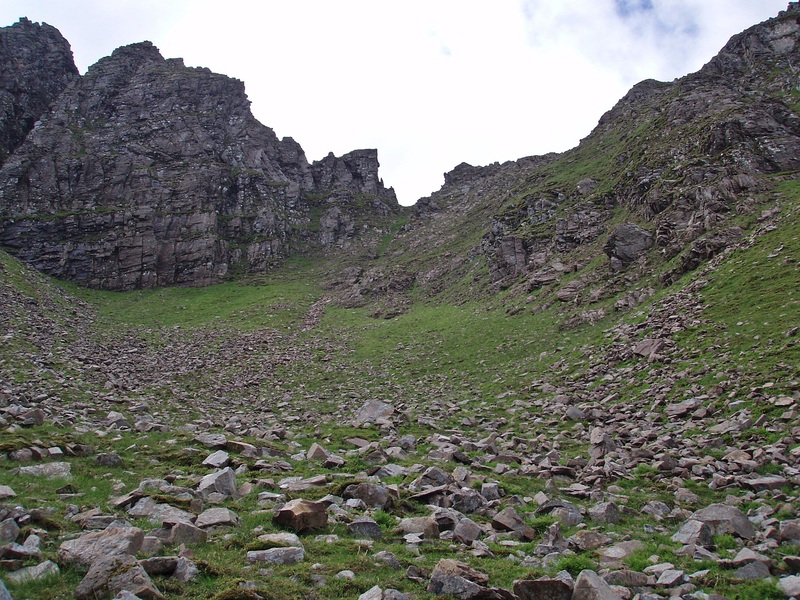 At the foot of the buttress I turned right and headed up over rough ground to the lowest point of the ridge between Còinneach Mhòr and Sail Mhòr. 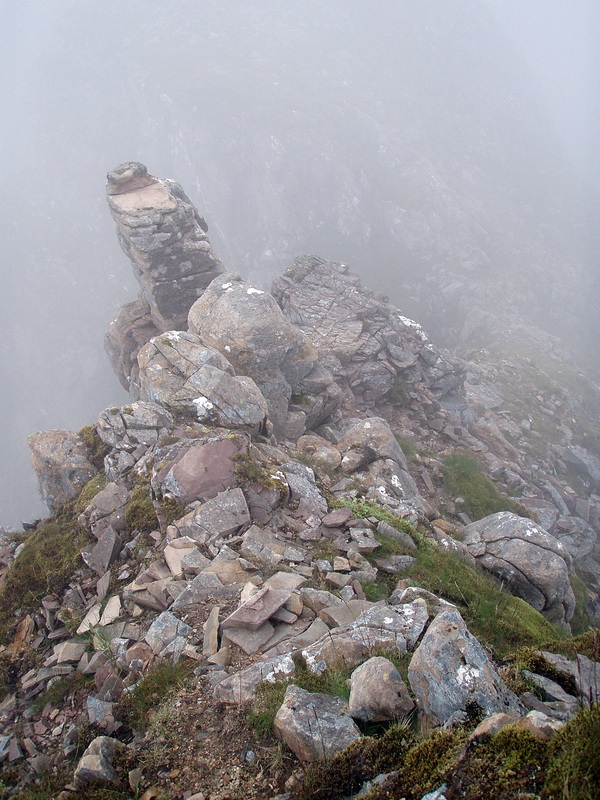 Higher up, there are traces of a path and the top of this route is marked by a tiny cairn on the ridge. As I was gaining height, the views got even better. 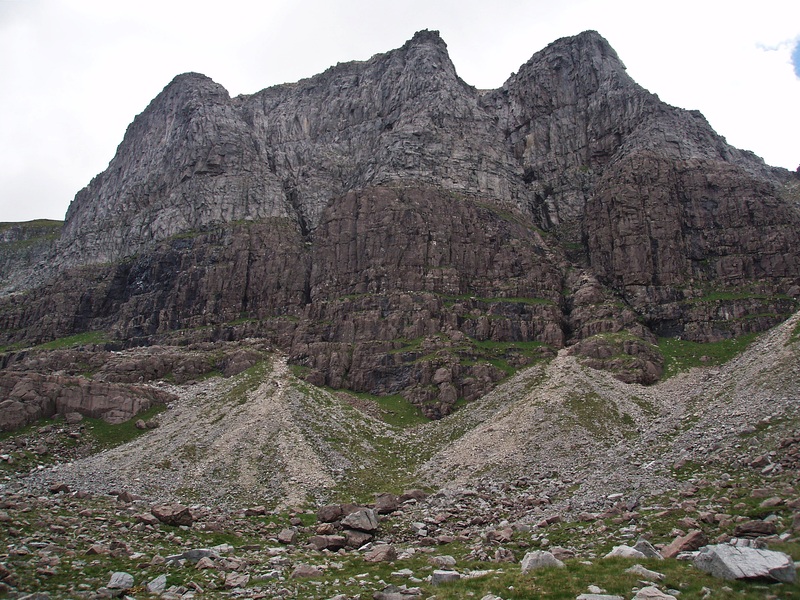 Ruadh-stac Mòr above Coire Mhic Fhearchair. 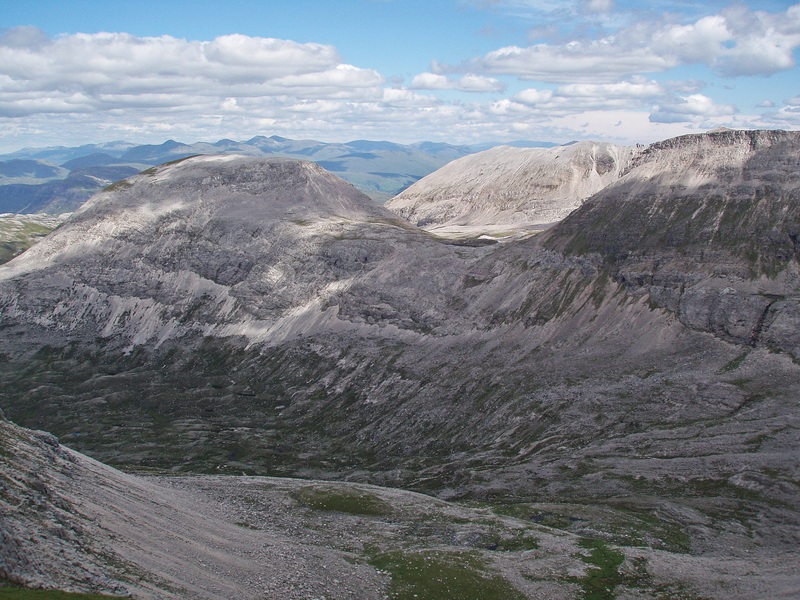 Coire MhicNòbaill and Beinn Alligin. 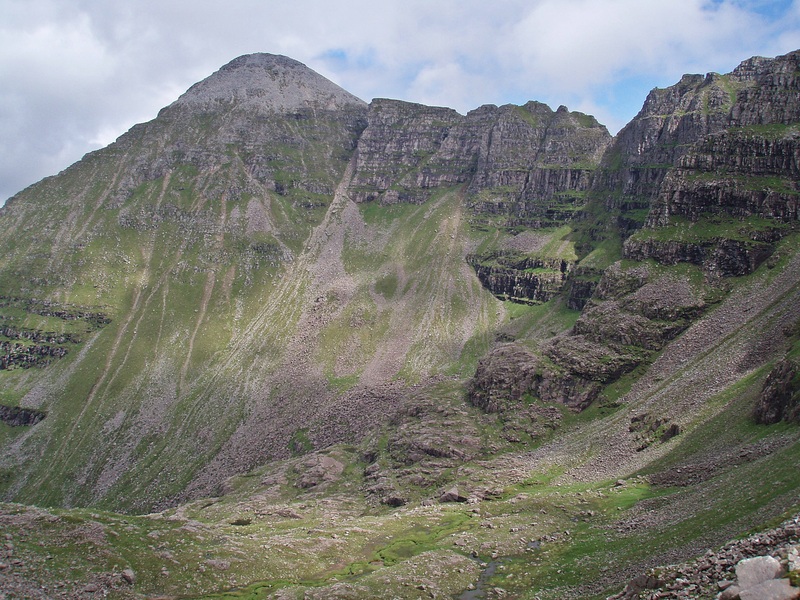 Liathach – today would have been a better day to climb Meall Dearg! 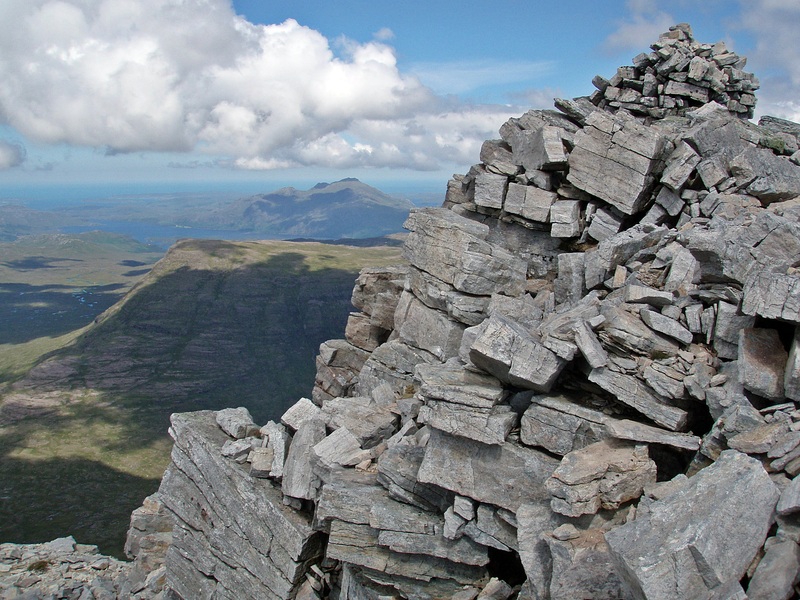 Near the summit of Sail Mhòr I came across a work of art similar to the “bookshelf” I had found on Beinn Alligin in October 2012. 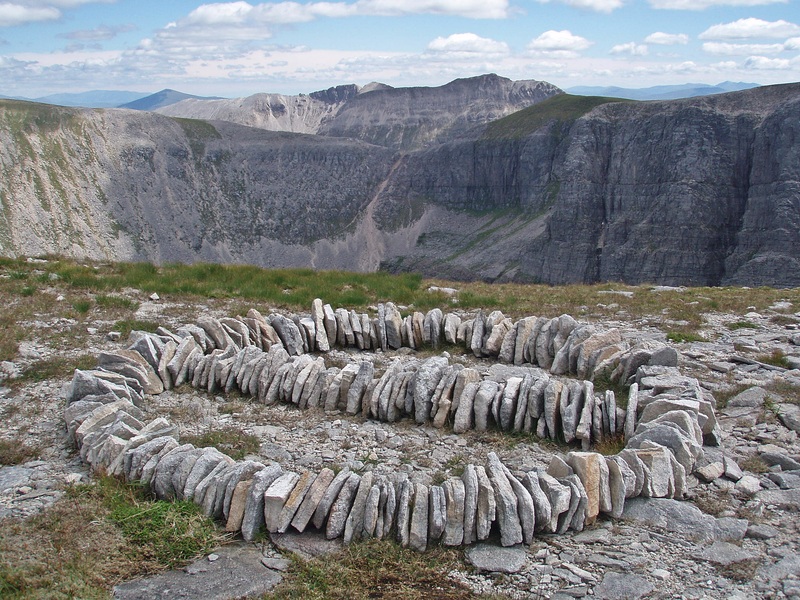 I know that some people don’t like to see this kind of thing on the hills, but I find it fascinating that someone would make such an effort to create this, and I actually find it quite pretty (it’s made of stones and as such a part of the hill, after all). 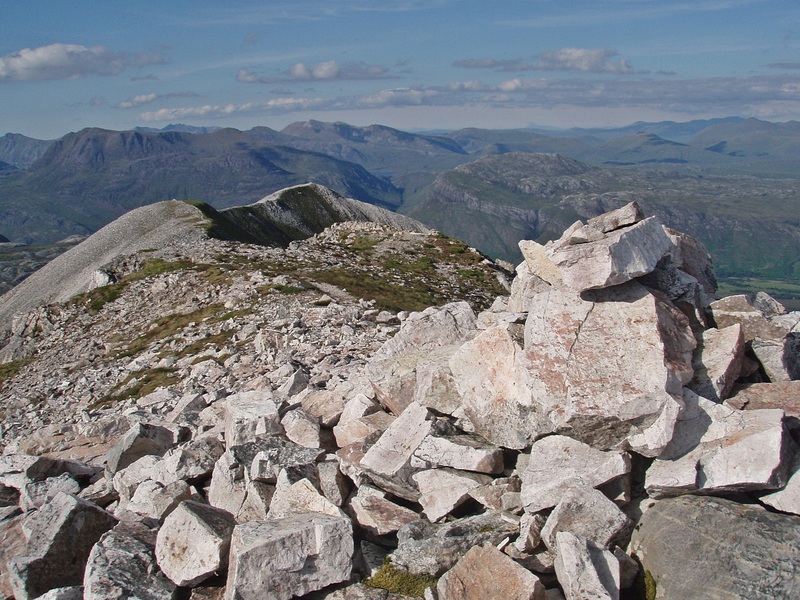 The first Munro Top of the day, Sail Mhòr. 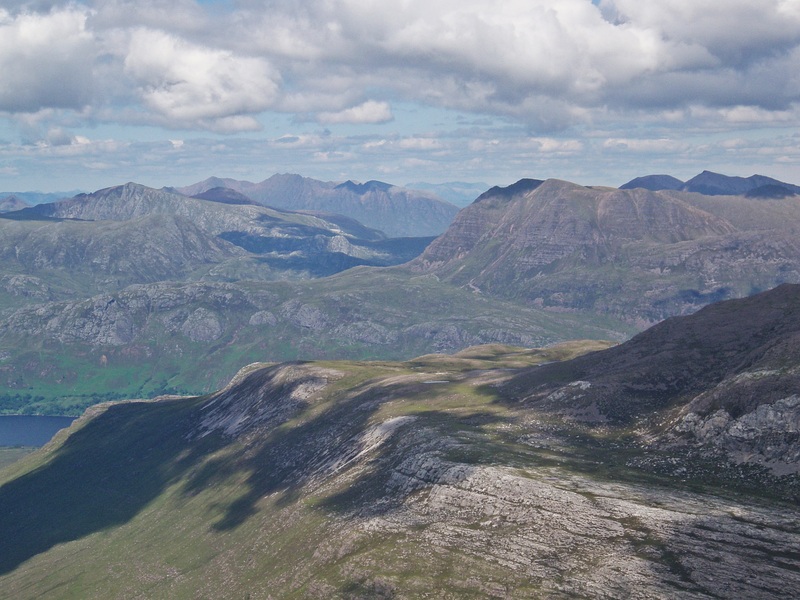 Patchwork of hills, lochs and clouds. 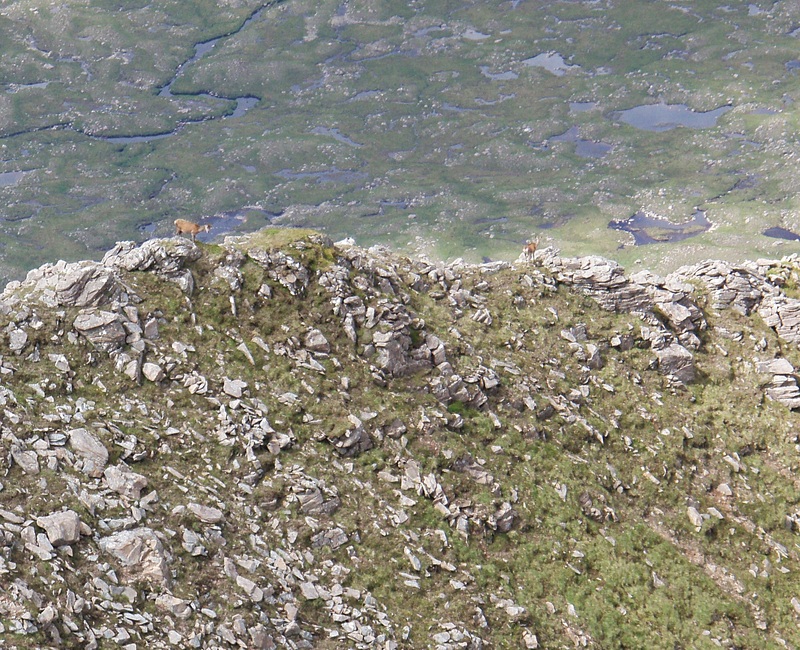 Deer with a head for heights on Sail Mhòr’s narrow N ridge. 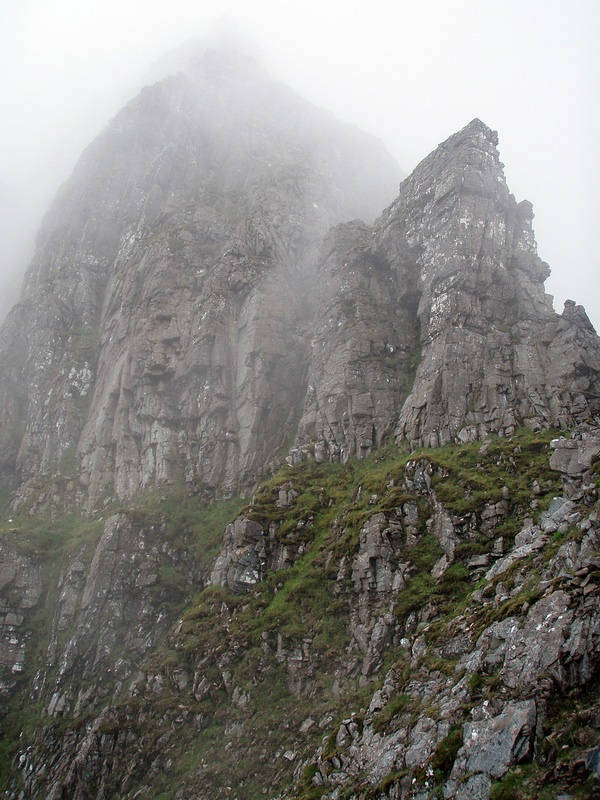 I couldn’t see an obvious route up, so I started walking around to the right. 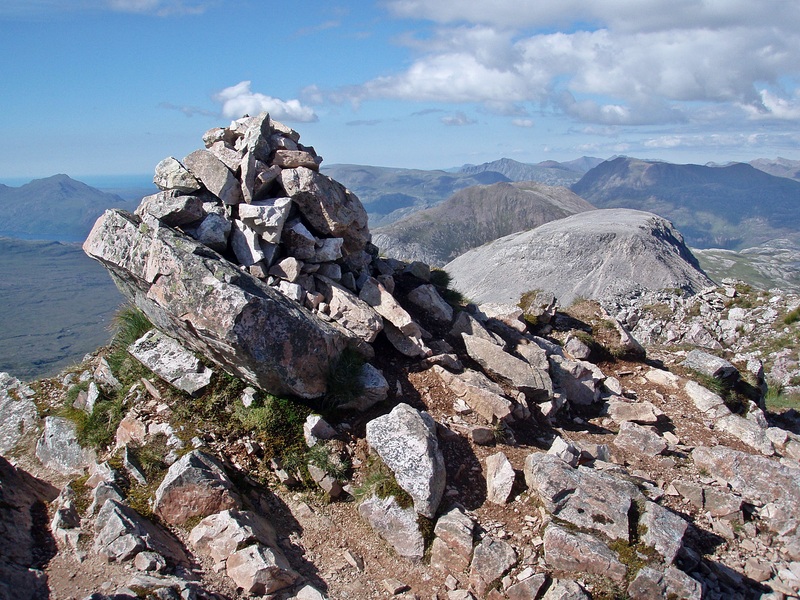 When I came across this cairn on top of a rock, I thought it might mark the start of the ascent route. 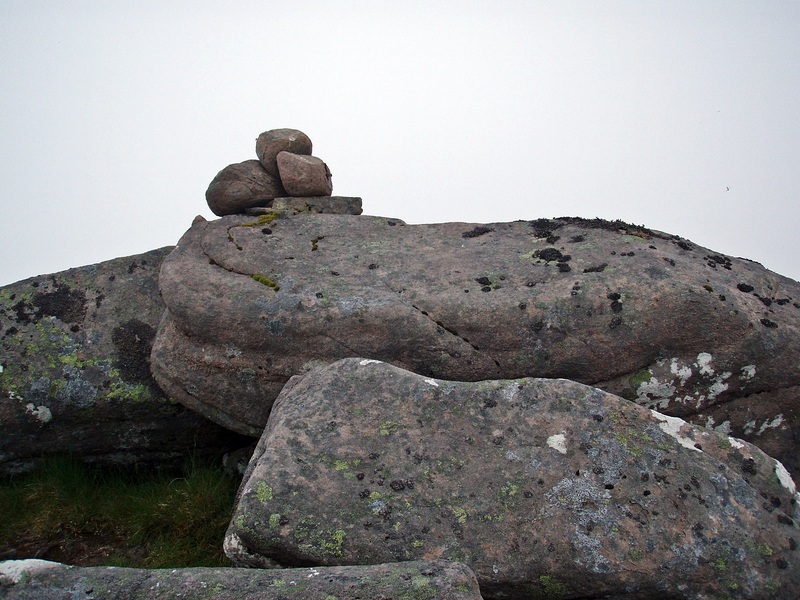 I climbed up to the cairn, but still couldn’t see a way up the rock face. 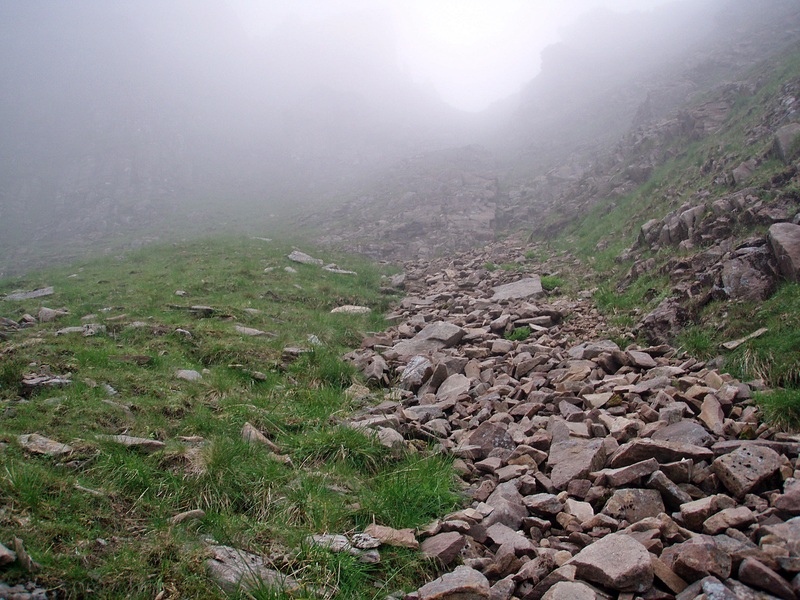 But I did see a faint path bypassing the rocks, so I followed it. 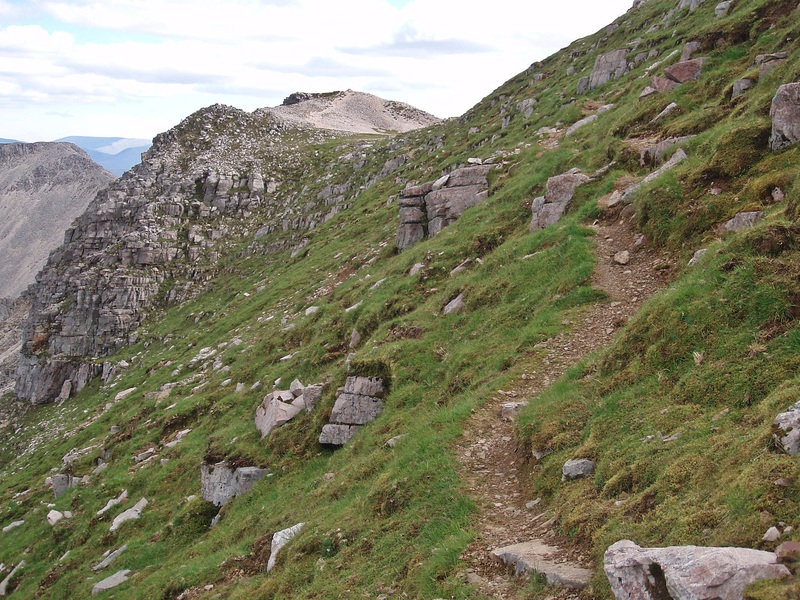 Unfortunately this path seems to descend continuously instead of giving access to the top of Còinneach Mhòr, so I turned back after a while, hoping to find another way up. 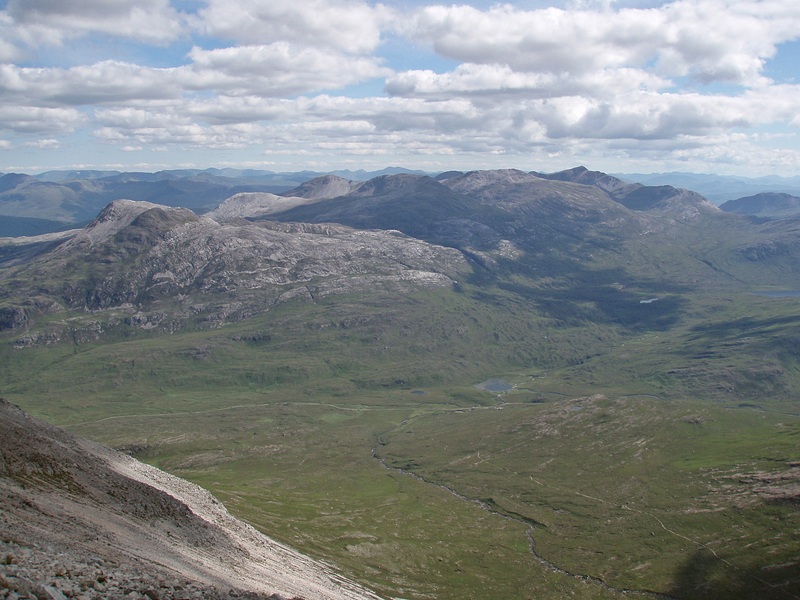 And on the way back I could actually see a possible route – the “staircase” in the centre of the photo. 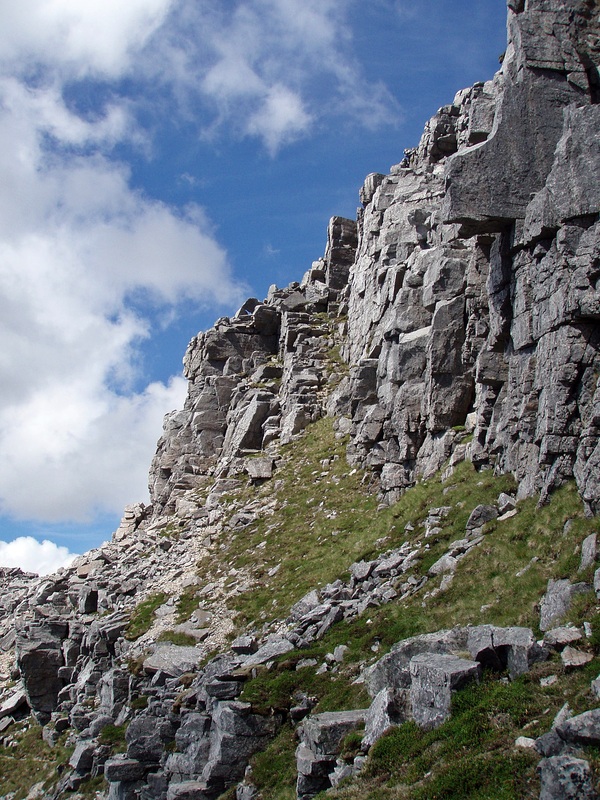 As it turned out, this was a perfectly safe ascent route, not too steep and with lots of holds. 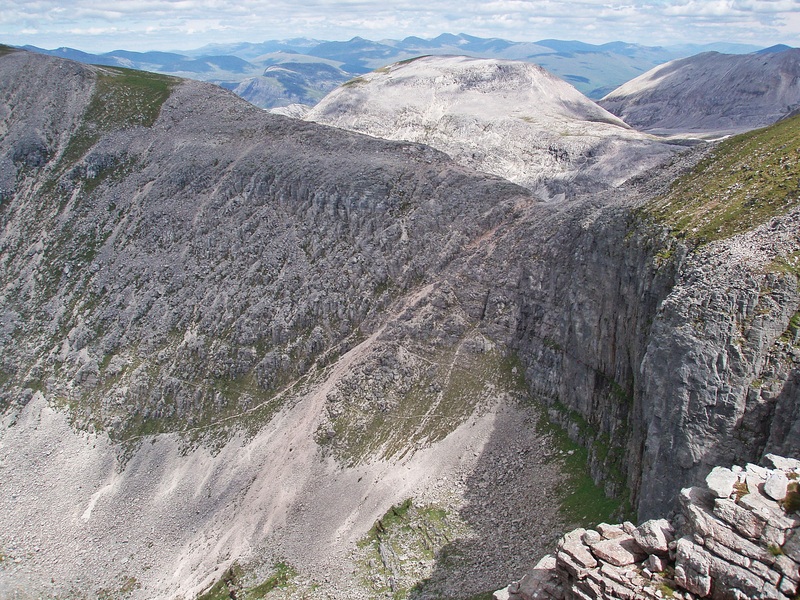 I was very relieved to have overcome the hardest part (or so I thought), only to be faced with some outwards sloping rock slabs which were just a bit too exposed for my liking. 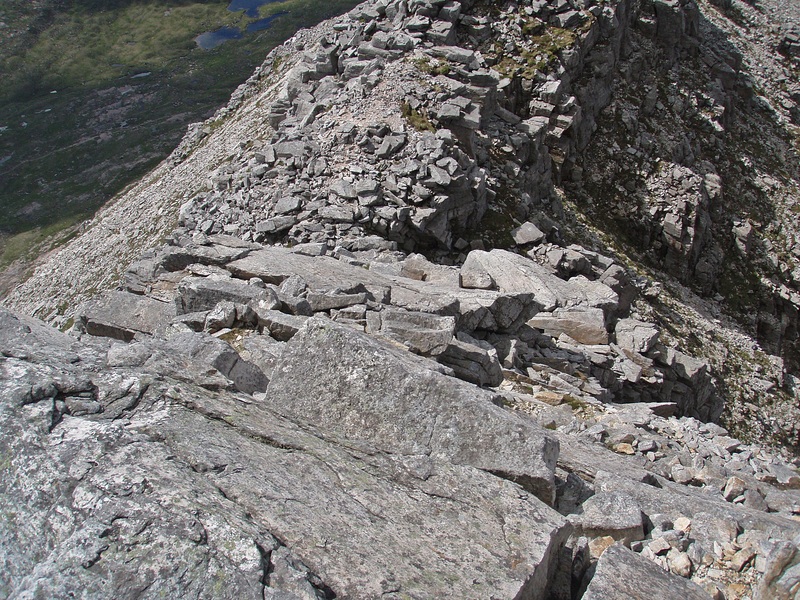 But looking around for a safer way up, I found an easy gully to the left of the slabs. 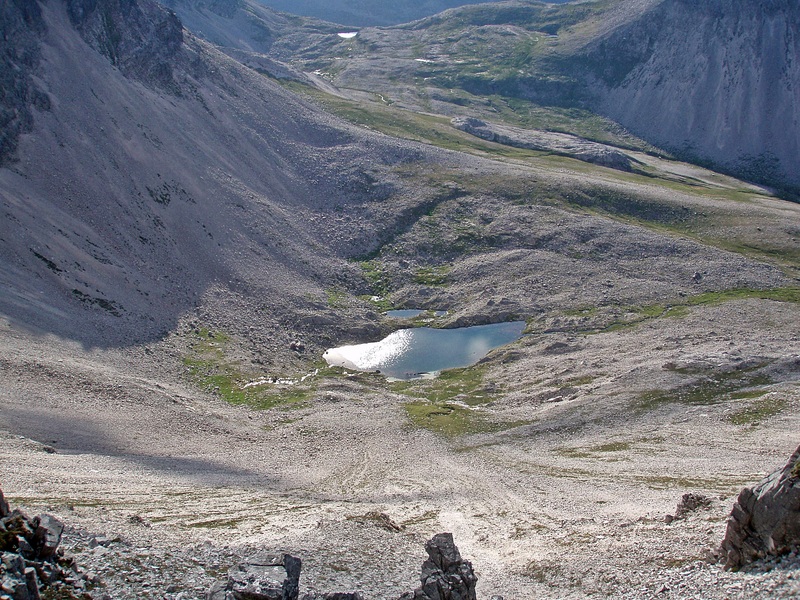 Looking down from about halfway up. 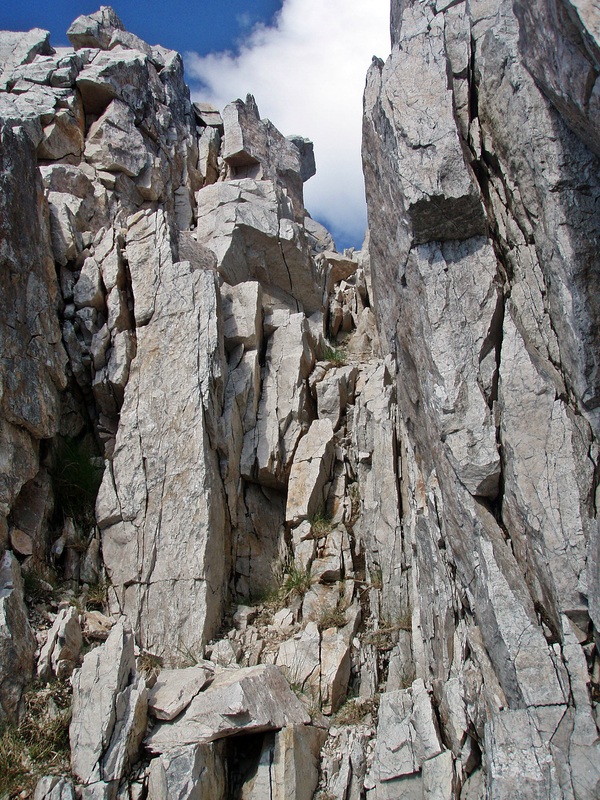 The rest of the ascent is straightforward scrambling over rock steps with plenty of handholds. 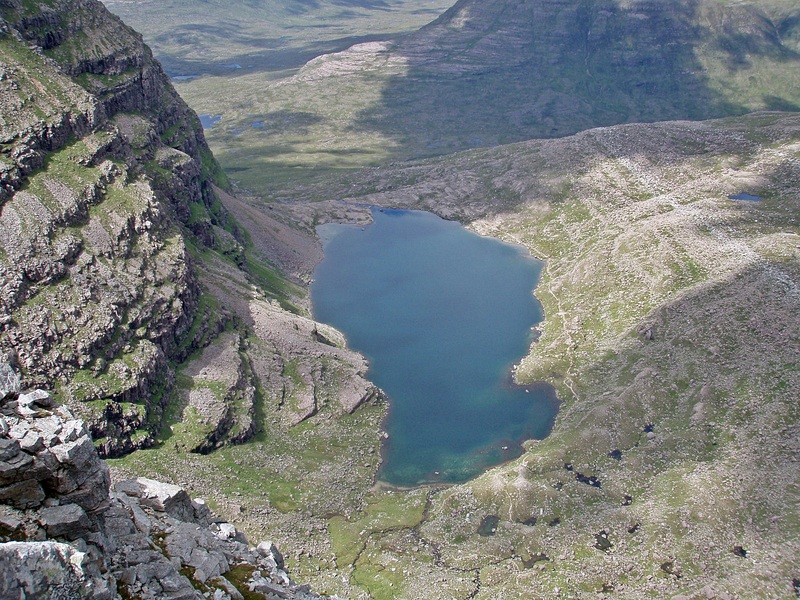 View down to Loch Coire Mhic Fhearchair. 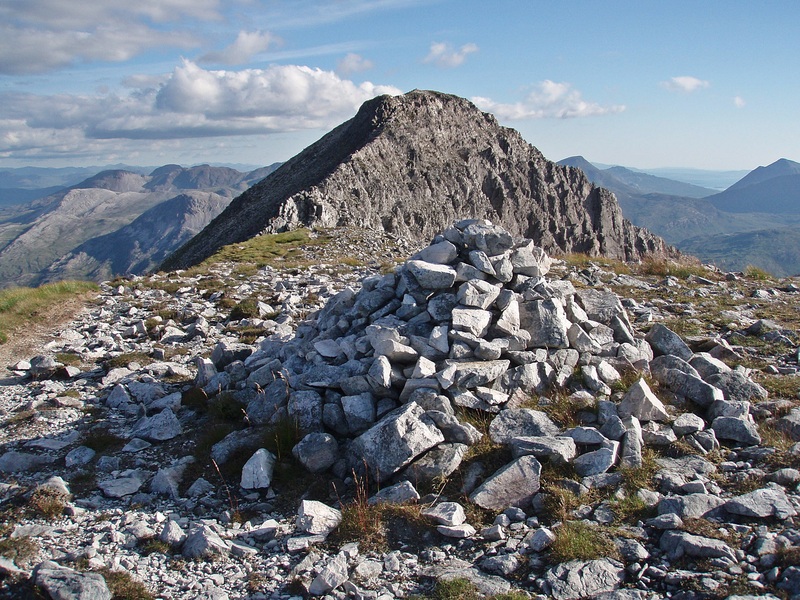 Compared to Meall Dearg, the (allegedly) hardest Munro Top on the mainland, I actually found this one harder because the correct route is not obvious at all. 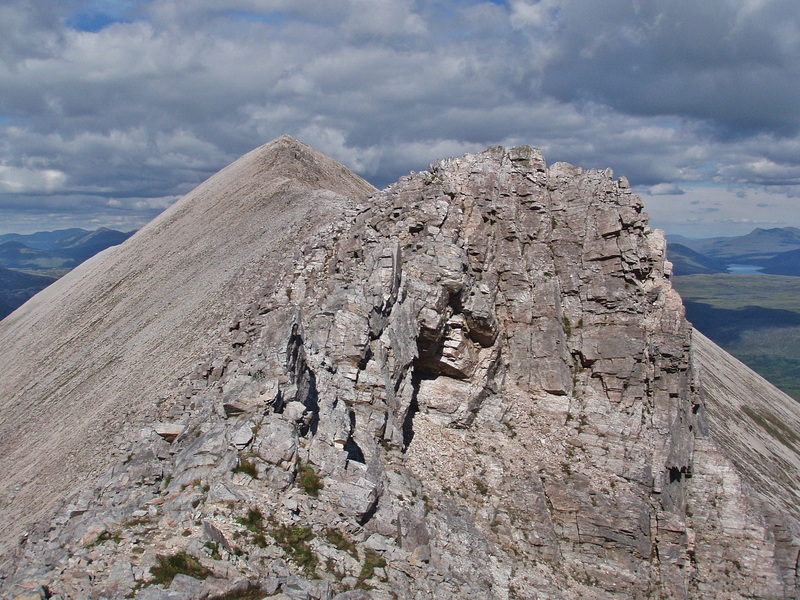 I wasted a lot of time with route finding and when I finally reached the summit of Còinneach Mhòr, it was already after 14:00. 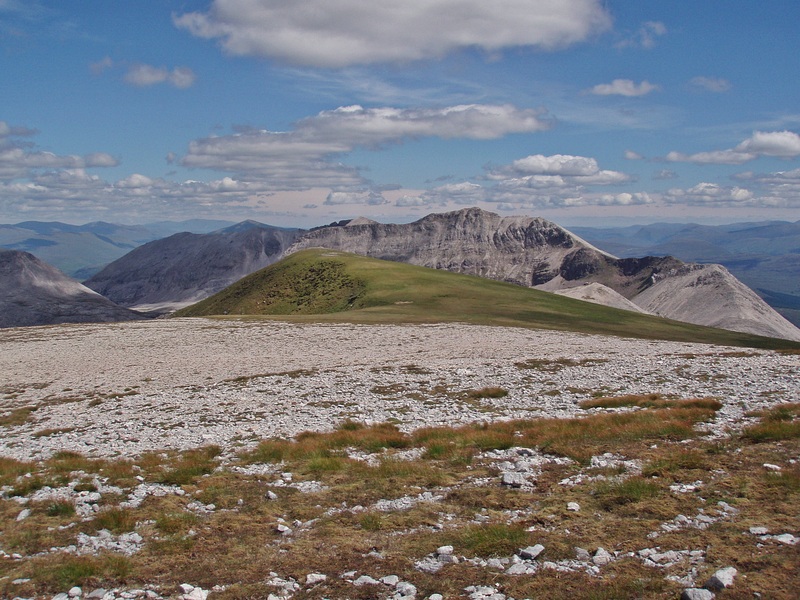 The wide plateau beyond Còinneach Mhòr with the rest of Beinn Eighe behind – still a long way to go! 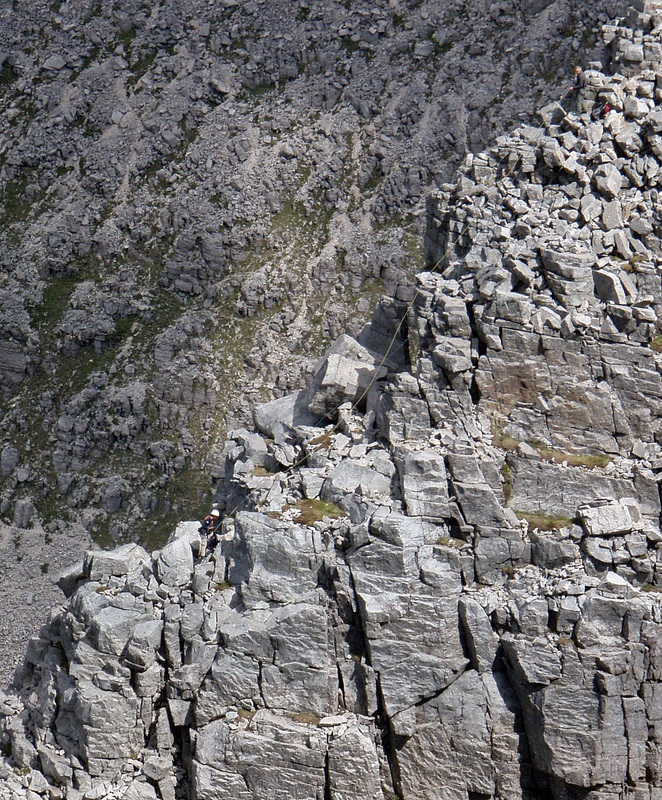 On my way along the rim of the coire I finally managed to spot the two rock climbers. 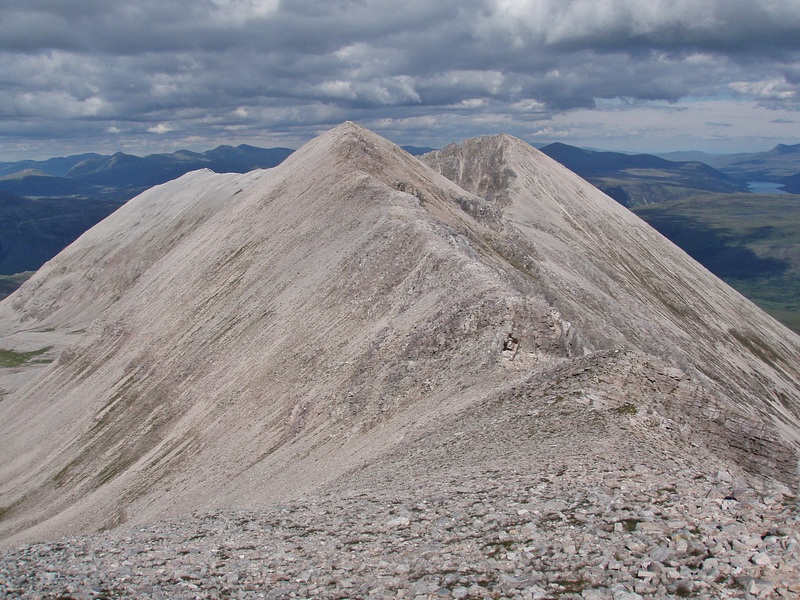 Looking back to Sail Mhòr. 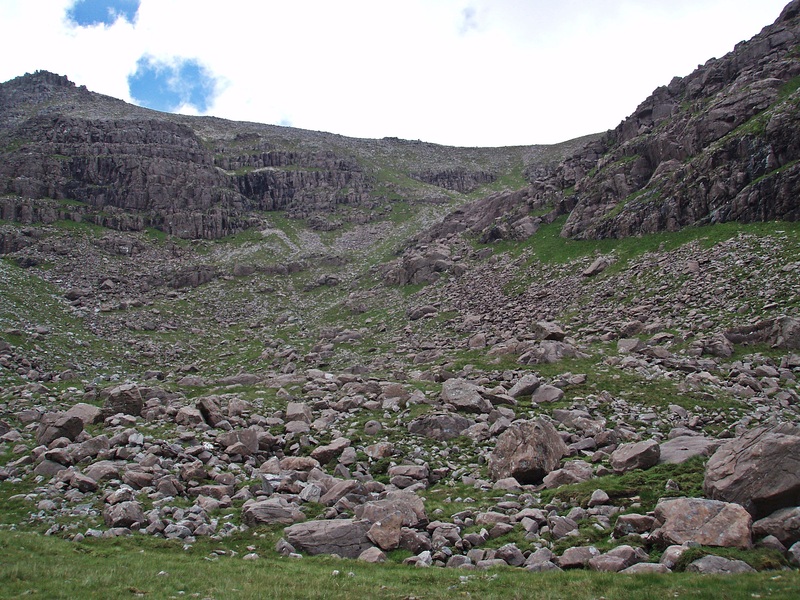 The normal ascent route from the loch to the col between Ruadh-stac Mòr and Còinneach Mhòr. 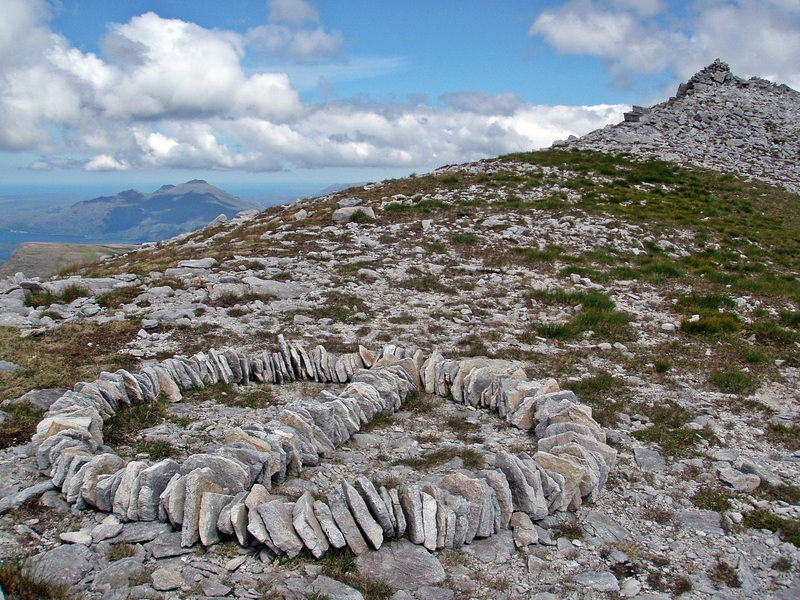 Cairn at the E end of Còinneach Mhòr. 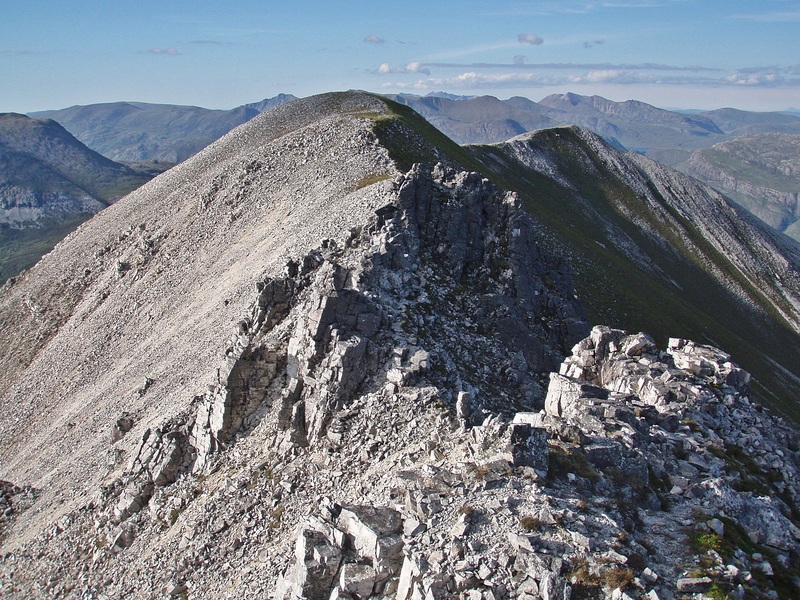 Looking along the ridge to Spidean Coire nan Clach. 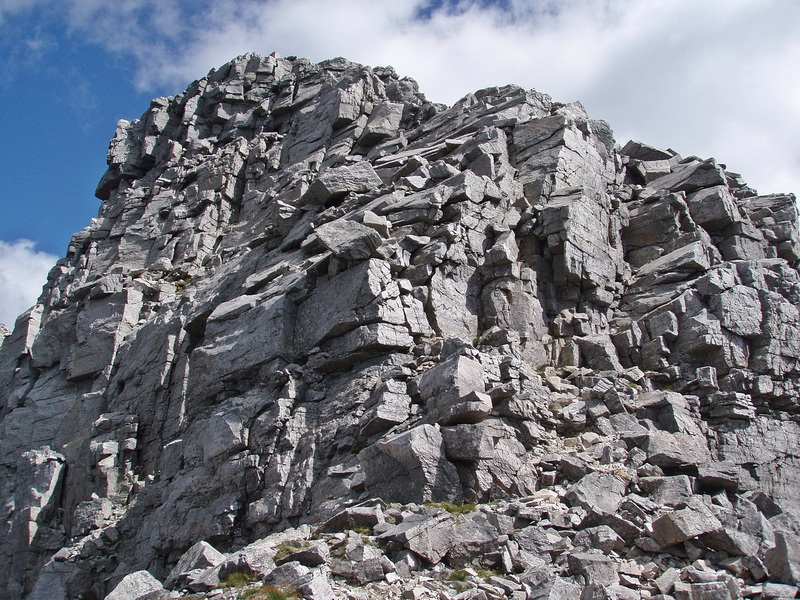 The climbers topping out on Còinneach Mhòr. 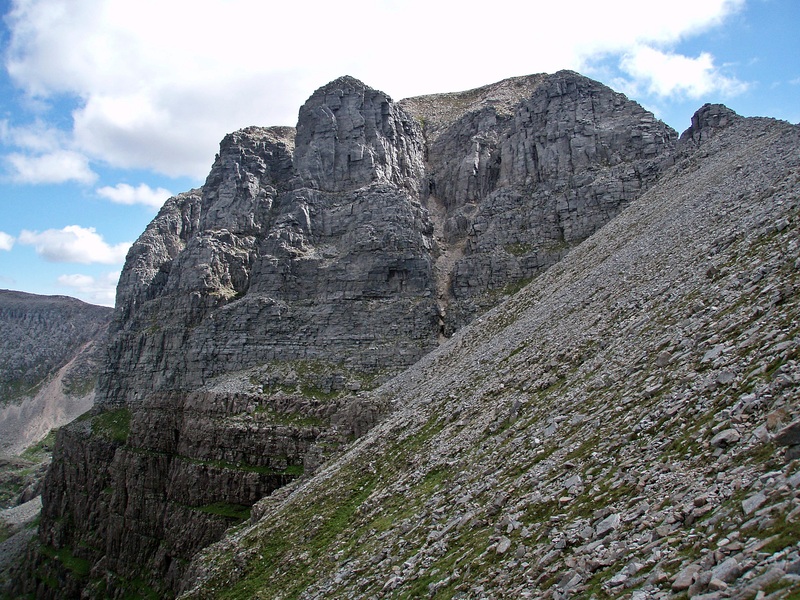 Vertical crags below Còinneach Mhòr. 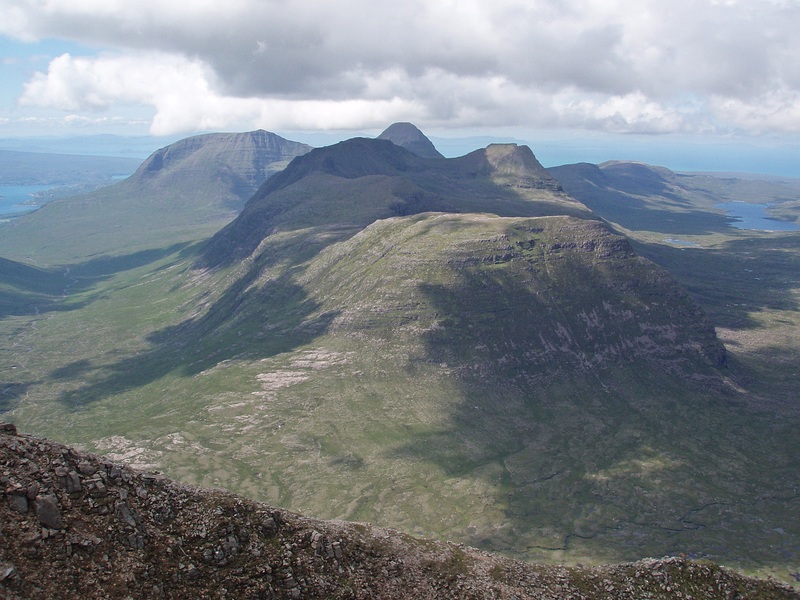 Beinn Làir and Slioch, with An Teallach in between. 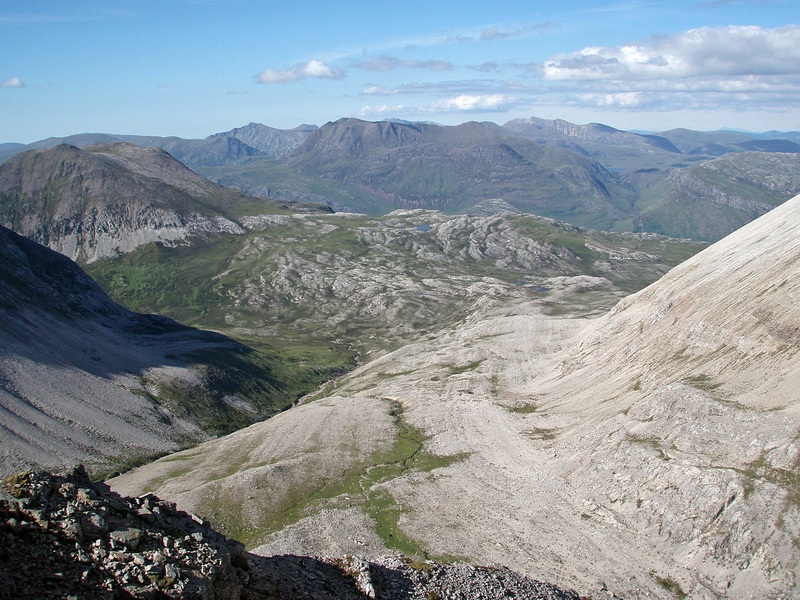 View NW towards the hills of the Flowerdale Forest. 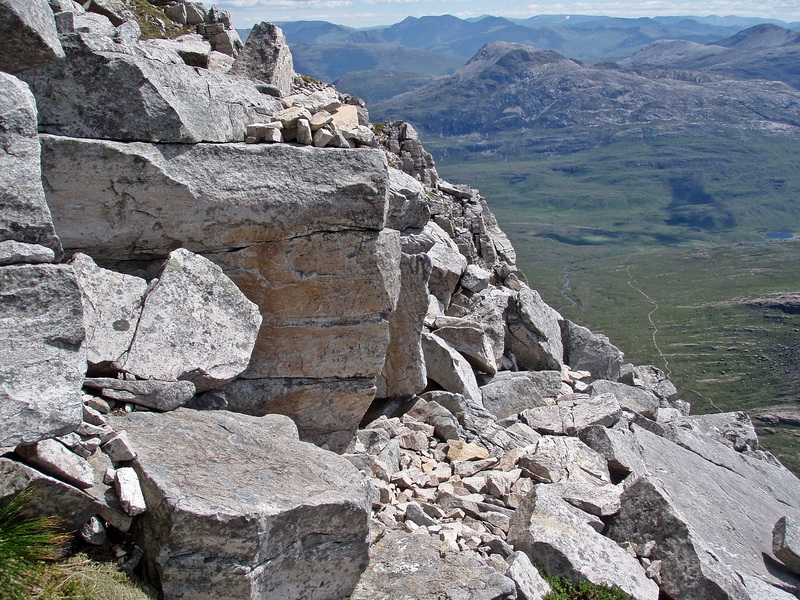 After enjoying the fantastic views in all directions I returned to the col between Ruadh-stac Mòr and Còinneach Mhòr, but this time I used the bypass path on the E flank of Còinneach Mhòr that leads back onto the main ridge. 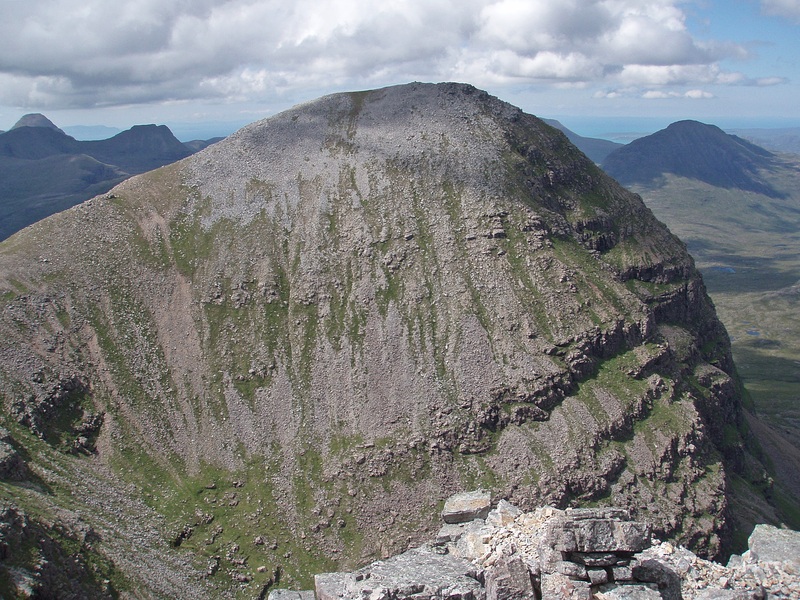 Looking back to Ruadh-stac Mòr. 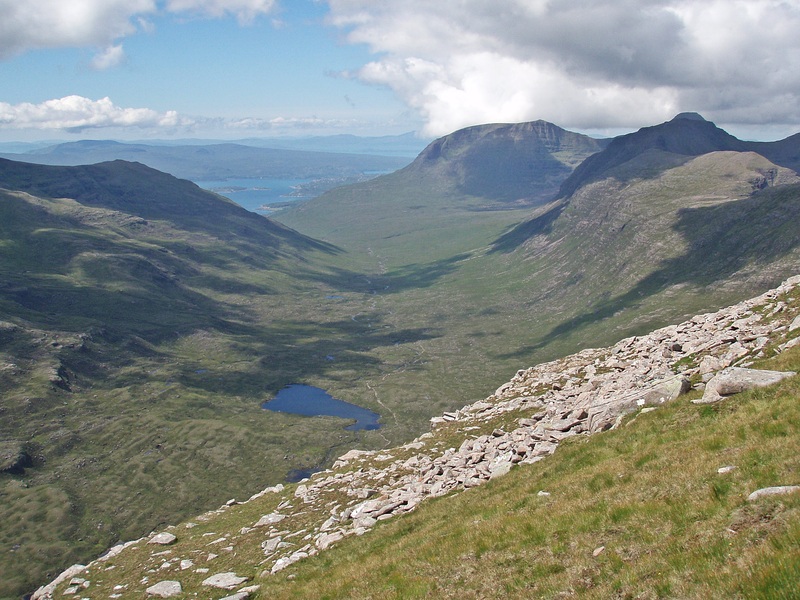 Across Glen Torridon to Sgùrr Dubh and the Achnashellach hills. 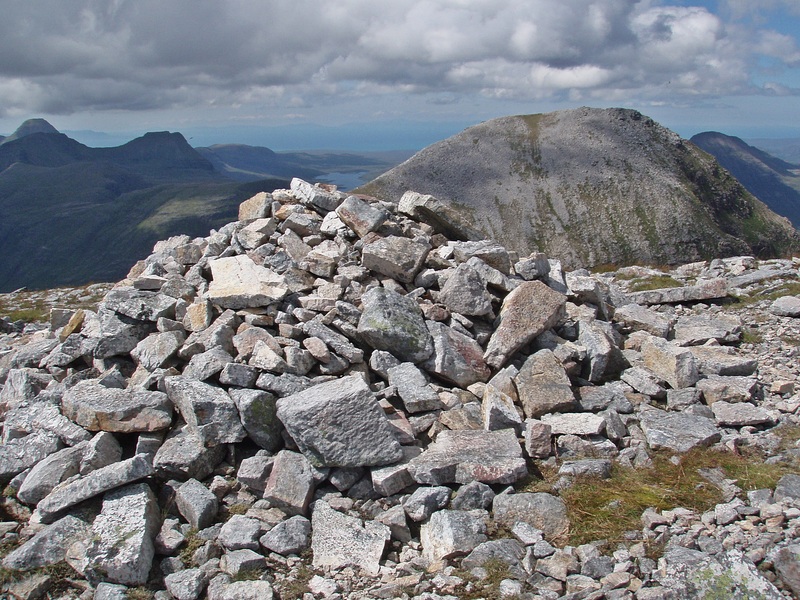 The trig point near the summit. 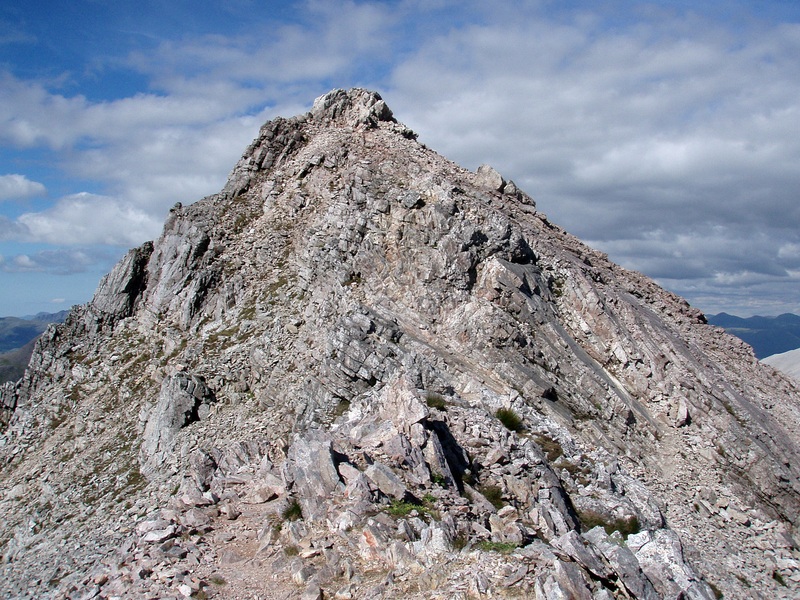 The summit is about 150 m further along the ridge. 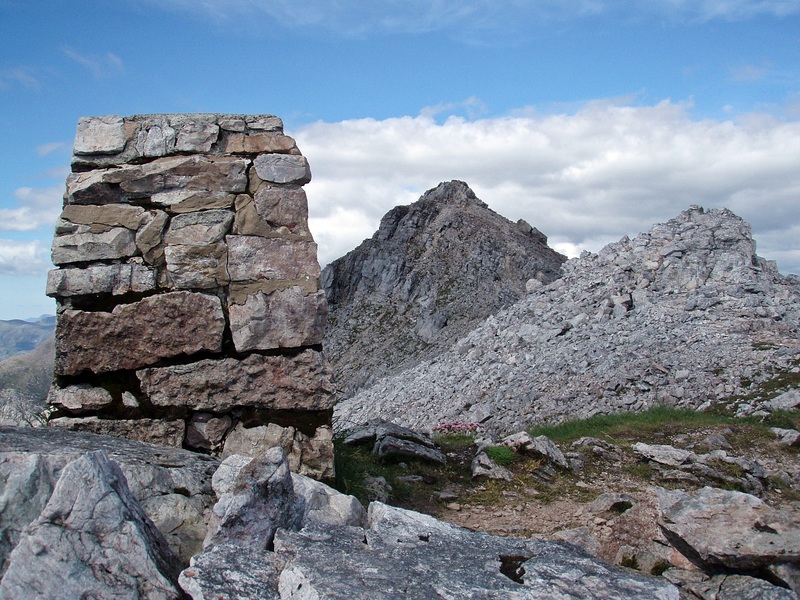 Spidean Coire nan Clach summit. 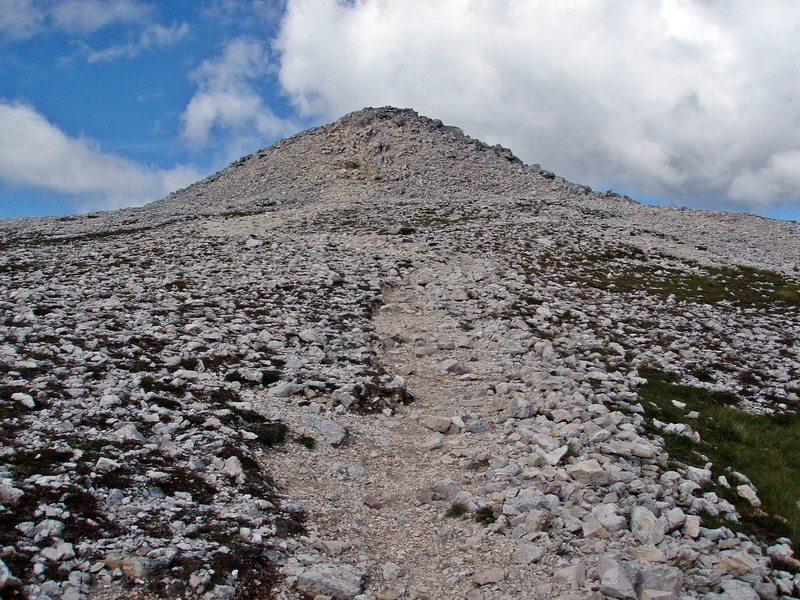 At this point my legs were beginning to feel tired, it was almost 17:00 and I still had a long way to go. 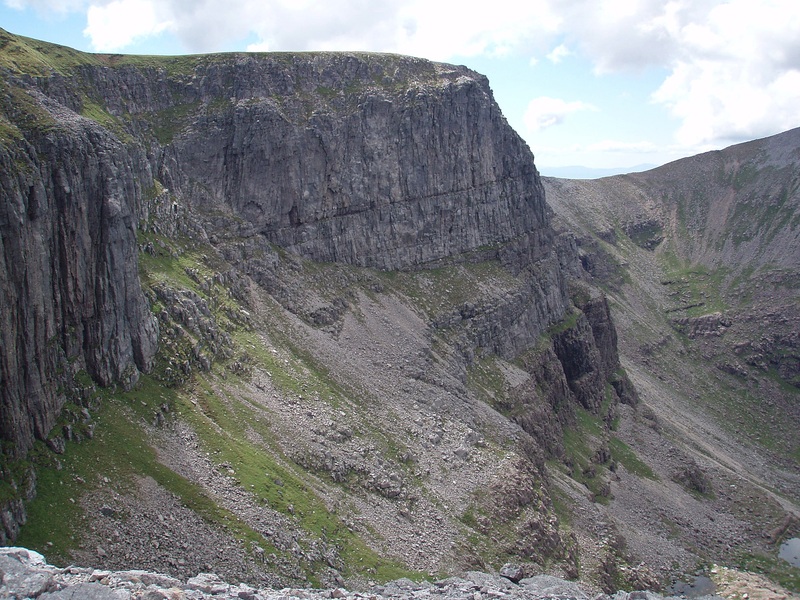 I was actually thinking about using the descent route via Coire an Laoigh, but then again I had plenty of daylight hours left and it would have been a shame not to take advantage of such a gorgeous day. 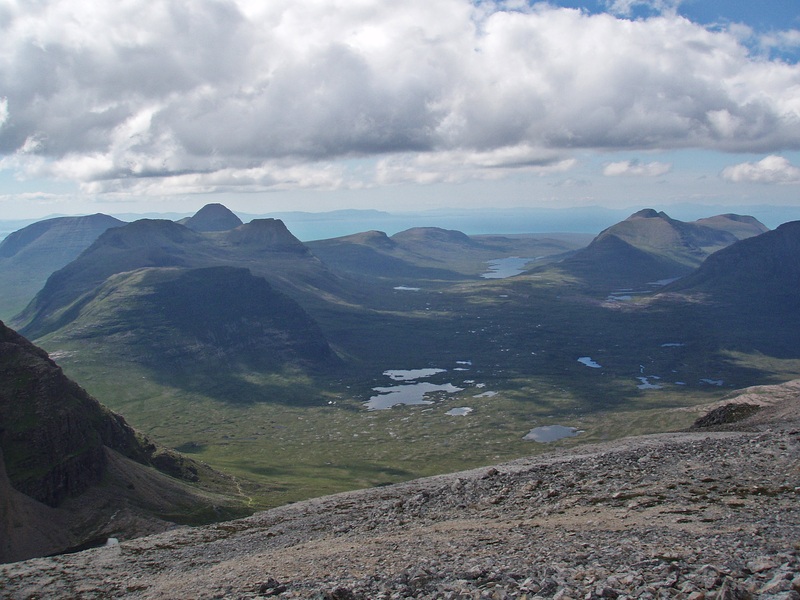 After all, it didn’t really matter at what time I would return to my tent! 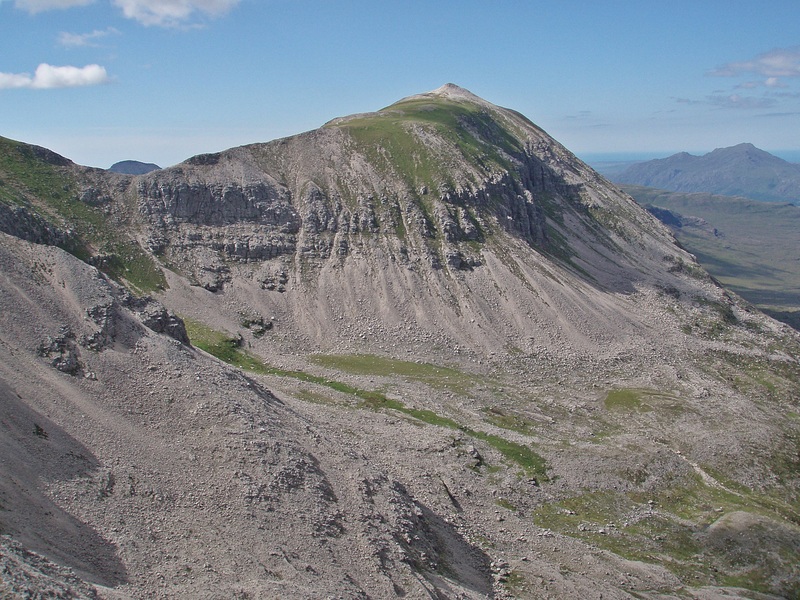 View towards Drochaid Allt Toll a’ Ghiubhais. 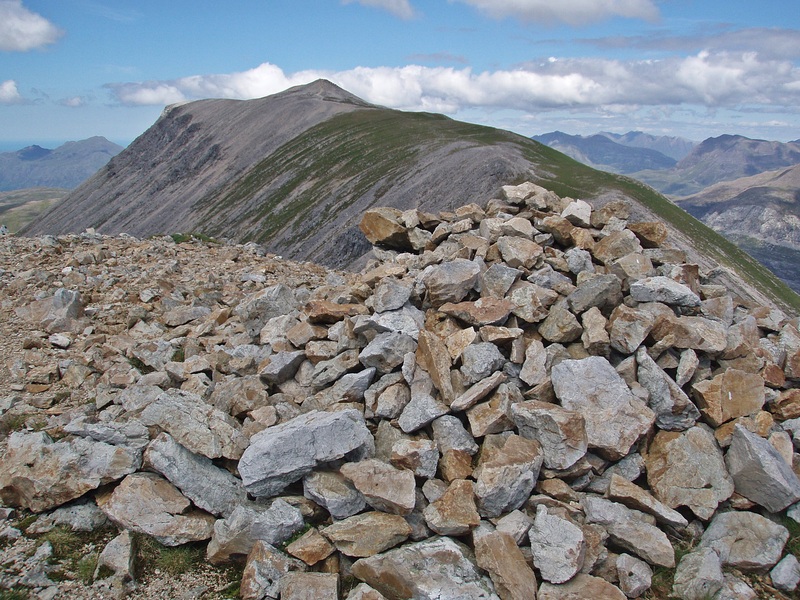 So I continued along the ridge to the third Munro Top, Sgùrr Bàn. 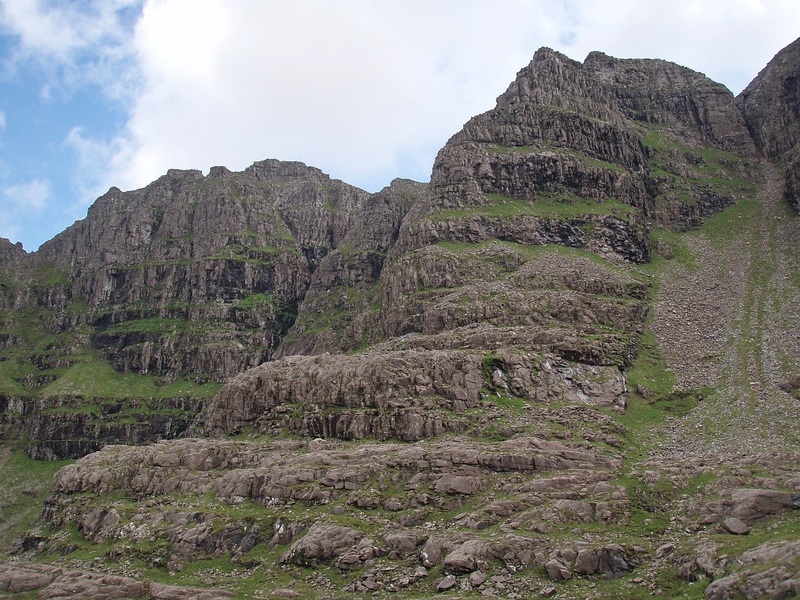 Rocky buttress on the way to Sgùrr Bàn. 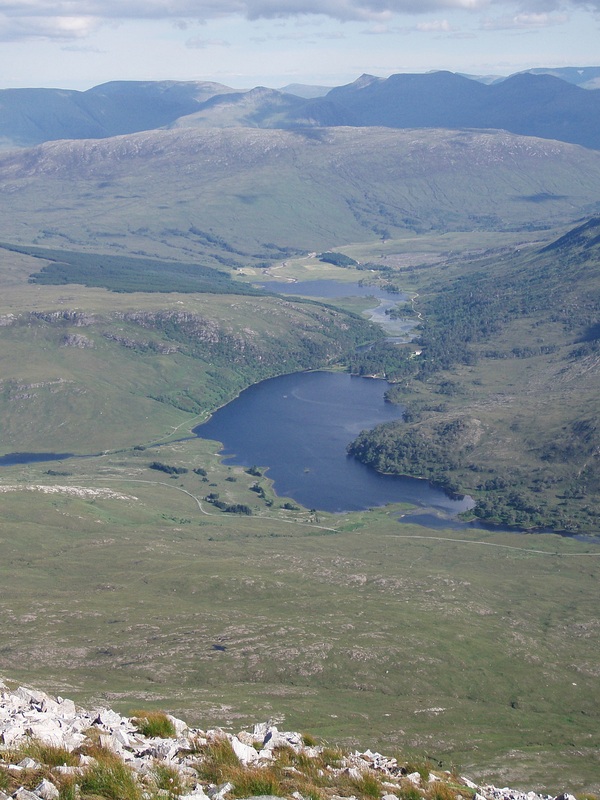 Loch Clair and Loch Coulin. 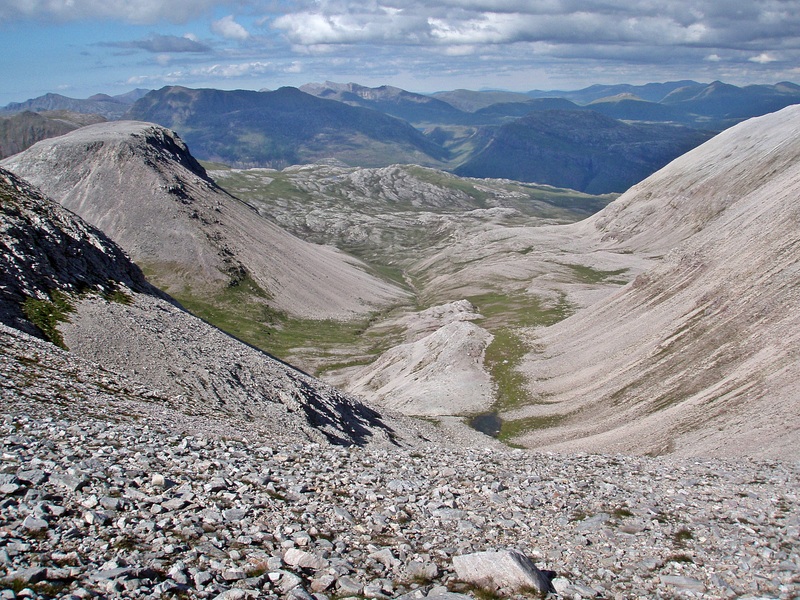 View across Drochaid Allt Toll a’ Ghiubhais to Slioch. 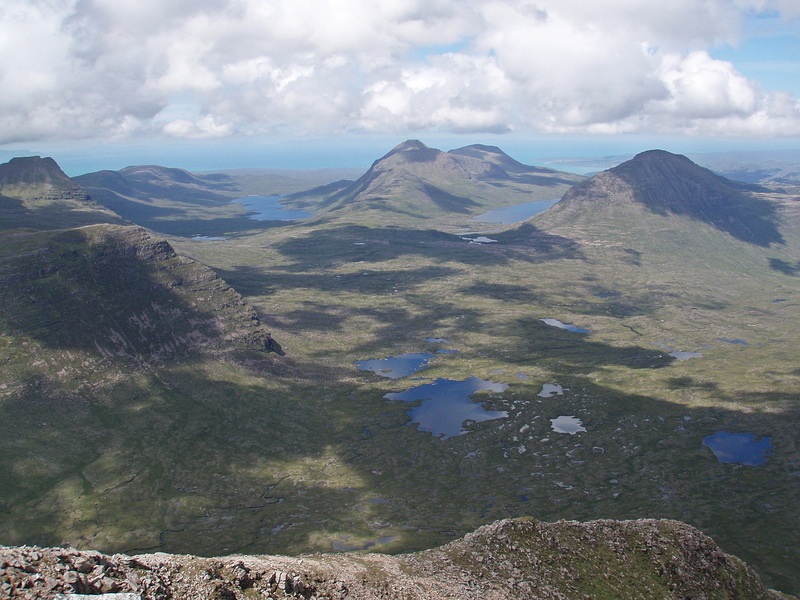 Sgùrr nan Fhir Duibhe and the Black Carls. 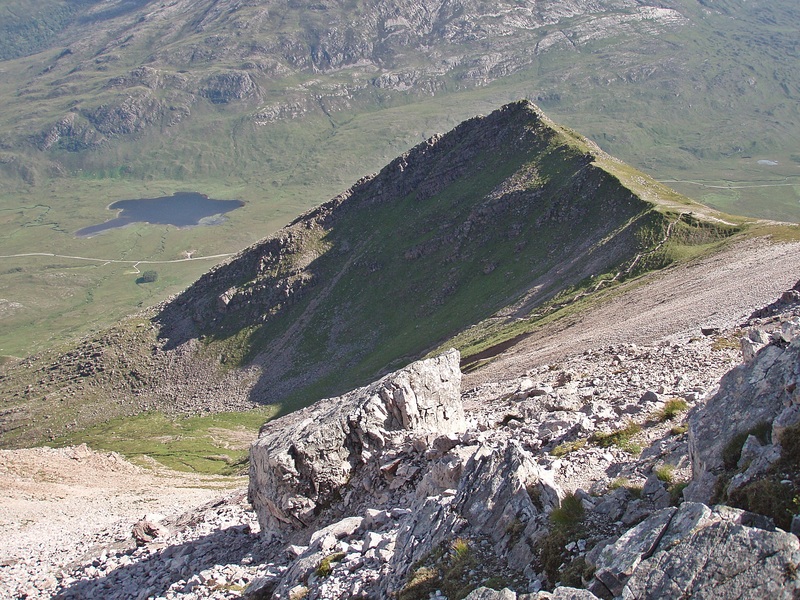 The last section before the summit of Sgùrr nan Fhir Duibhe is a steep slope of scree and boulders. 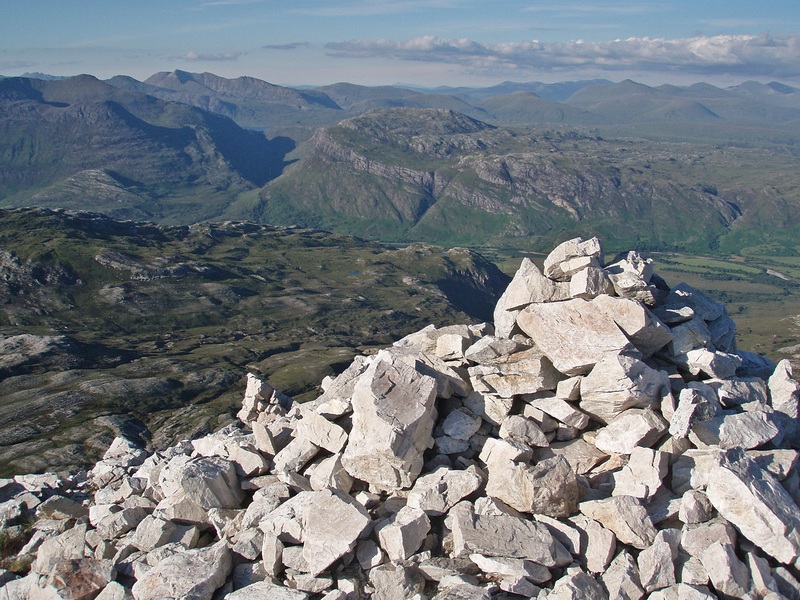 Normally I don’t mind this kind of terrain but at this time of day I found it quite strenuous to climb up loose stones and rocks that started moving and sliding when I stepped on them. 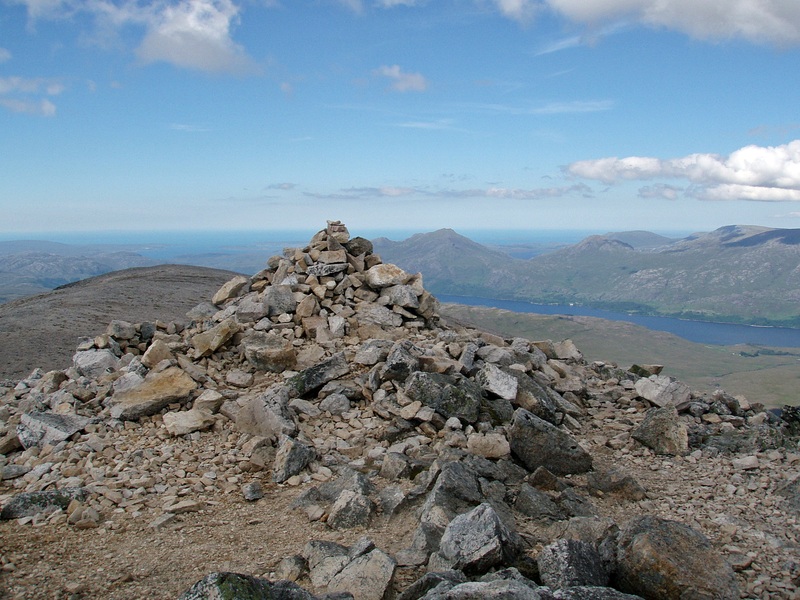 But eventually I reached the summit of the last Munro Top of the day, Sgùrr nan Fhir Duibhe. 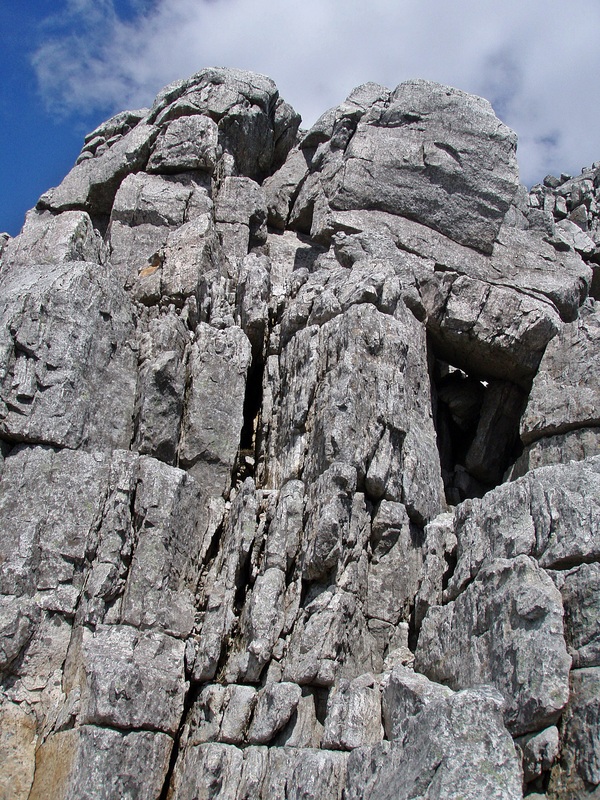 No time to relax yet – the Black Carls were waiting! 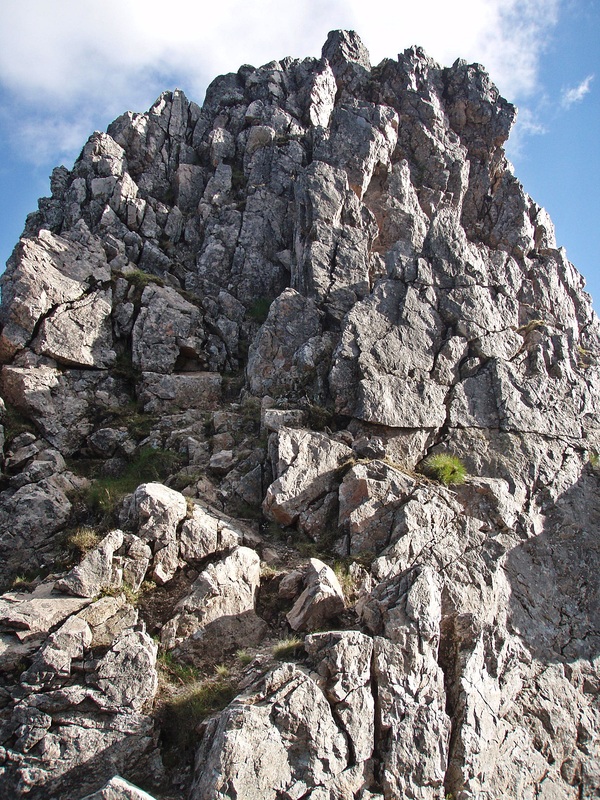 This time I had to downclimb these sections, and although they are not really difficult, I had to be careful not to lose concentration because of tiredness. 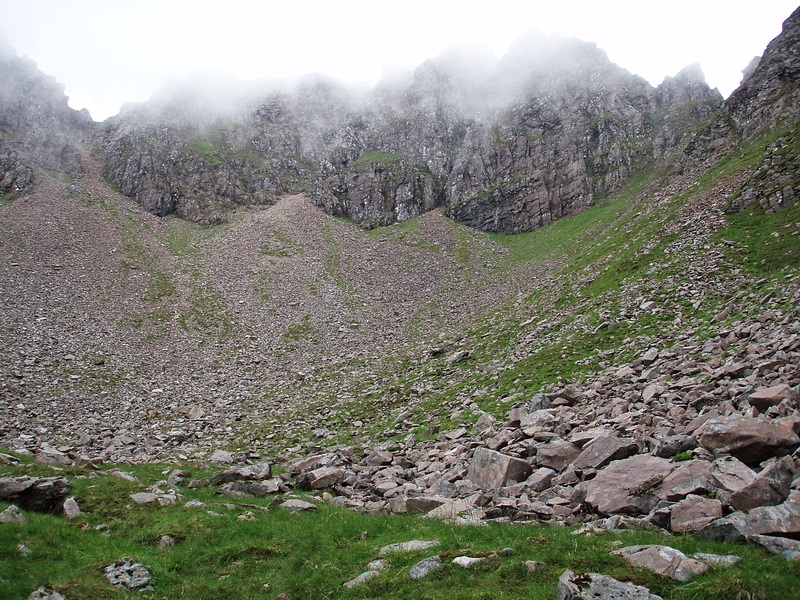 Coire Domhain, my descent route. 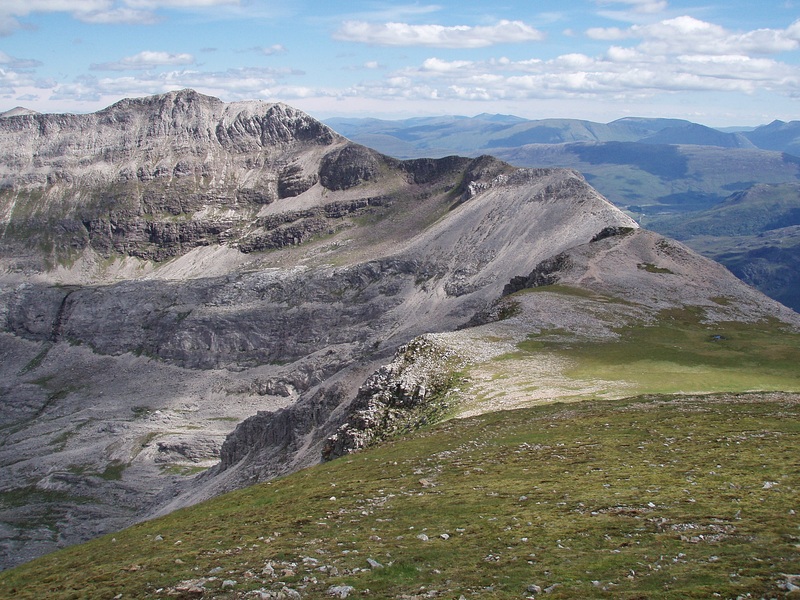 Now that the difficulties were over, I sat down for a well-deserved break and to refuel for the long descent. 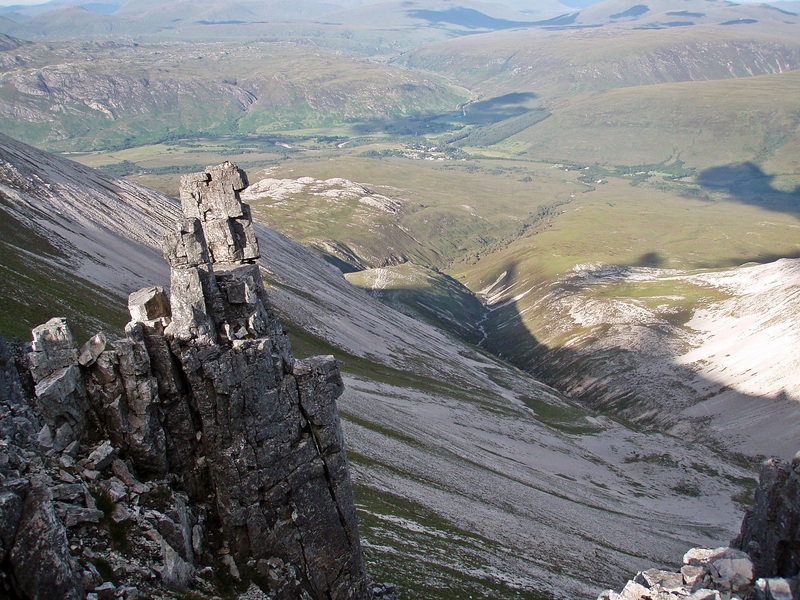 Looking back from the unnamed top between Sgùrr nan Fhir Duibhe and Creag Dubh. 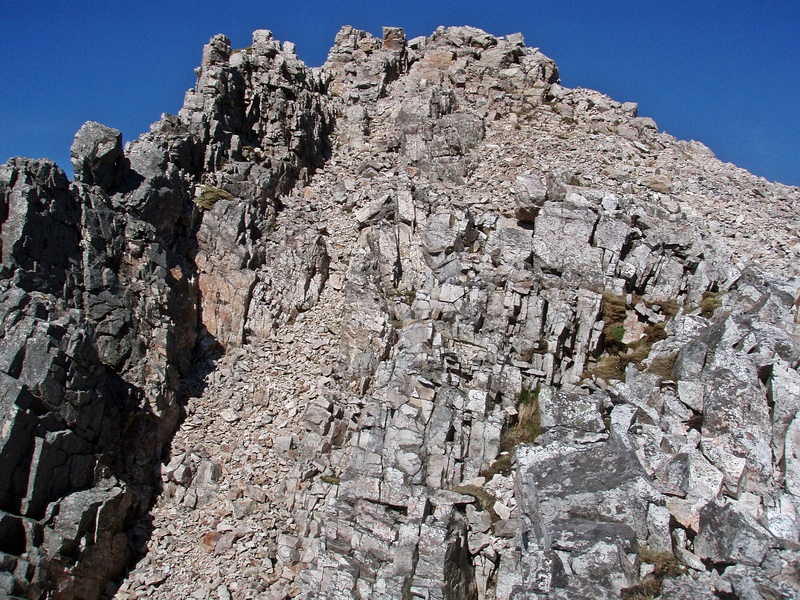 Last section of the ridge. 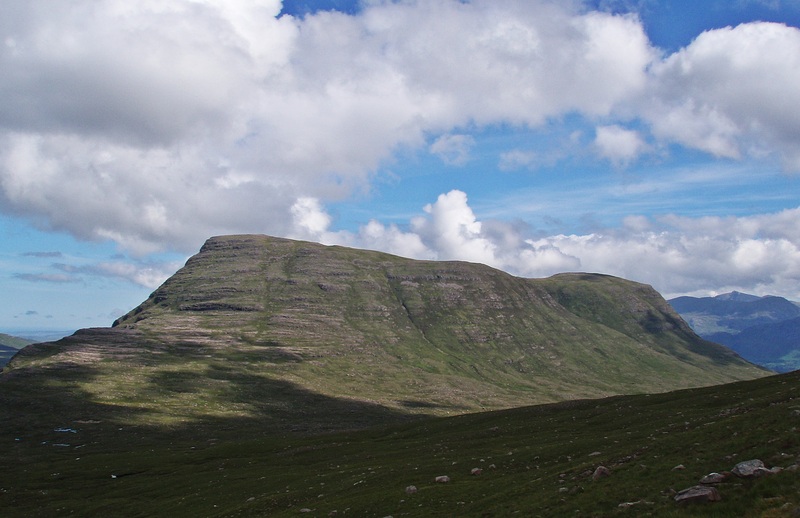 Creag Dubh, with Beinn a’ Mhùinidh behind. 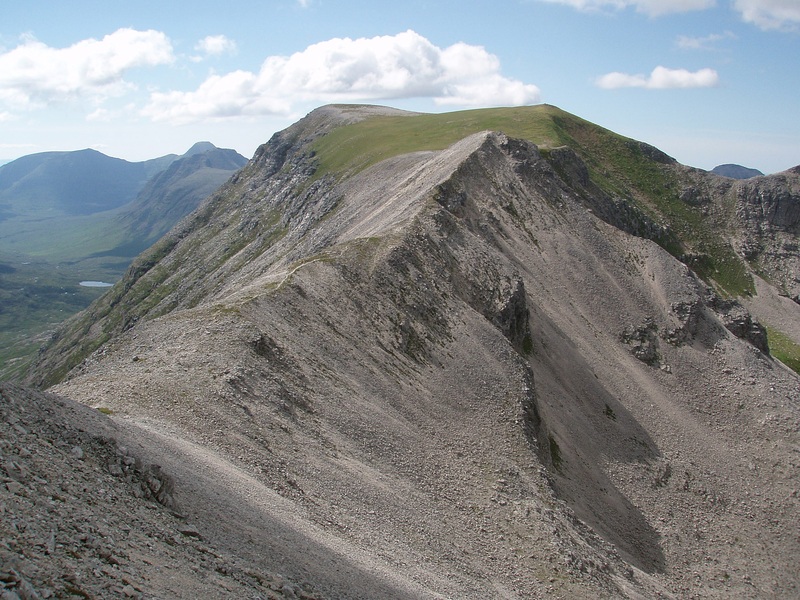 The descent route is a scree path along Creag Dubh’s E ridge. 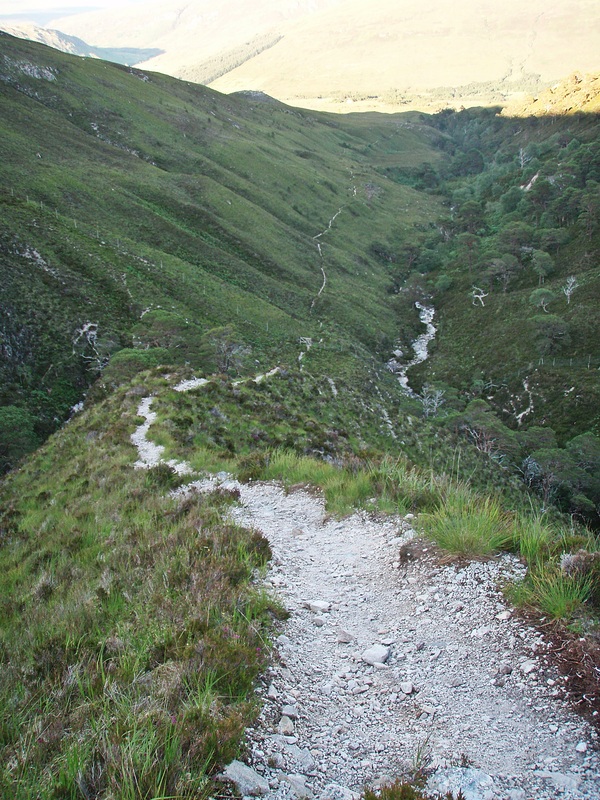 The path descends steeply into a gorge where the Allt a’ Chuirn has to be forded. 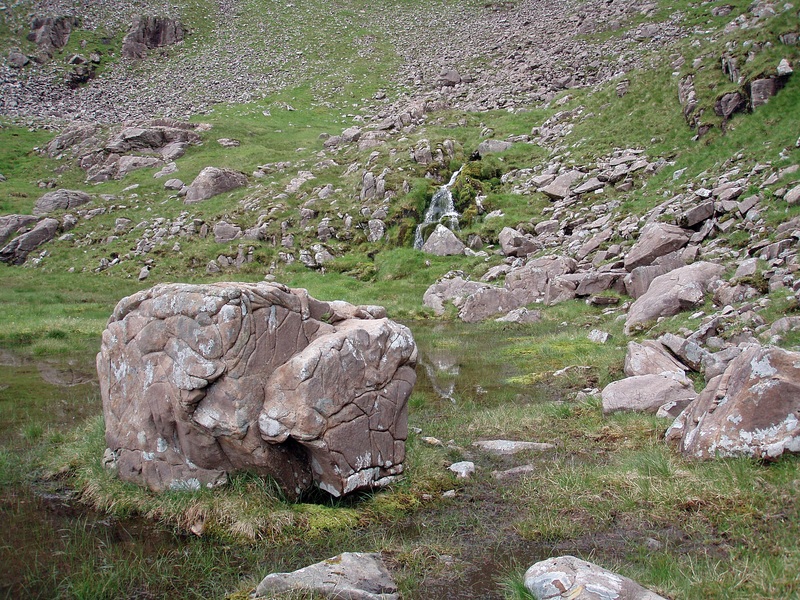 The ford itself consists of some slippery rock slabs with a tree root as a handrail. 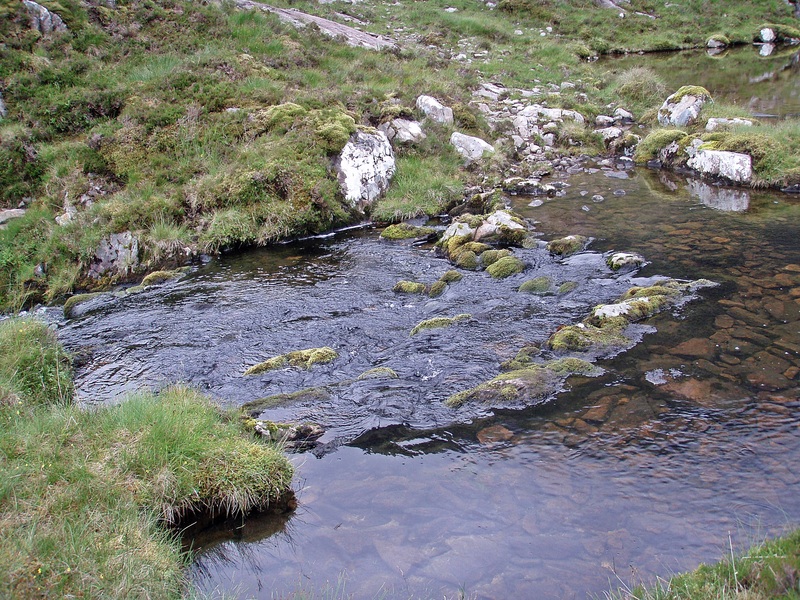 While I was tackling this awkward stream crossing, I was eaten alive by midges, hence no photos of this section! 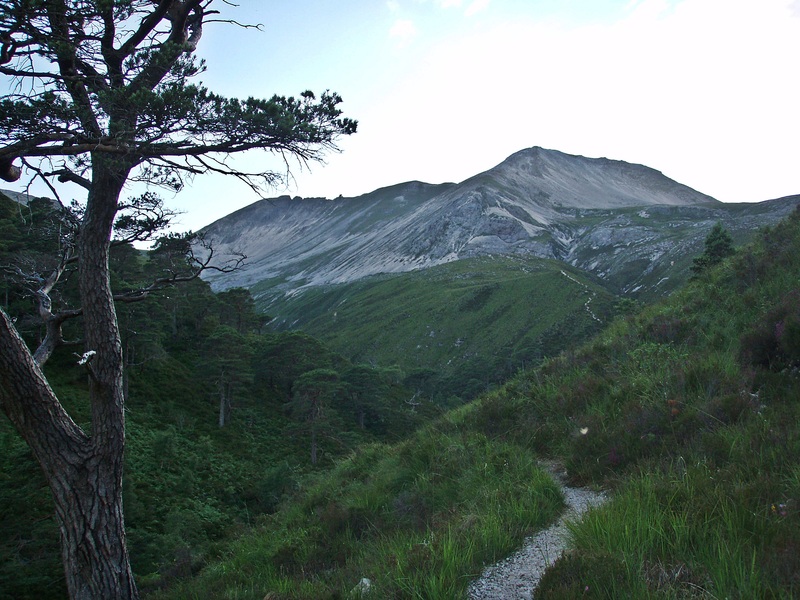 I hurried along the path to escape from the midges, and arrived back at my car at 21:15. 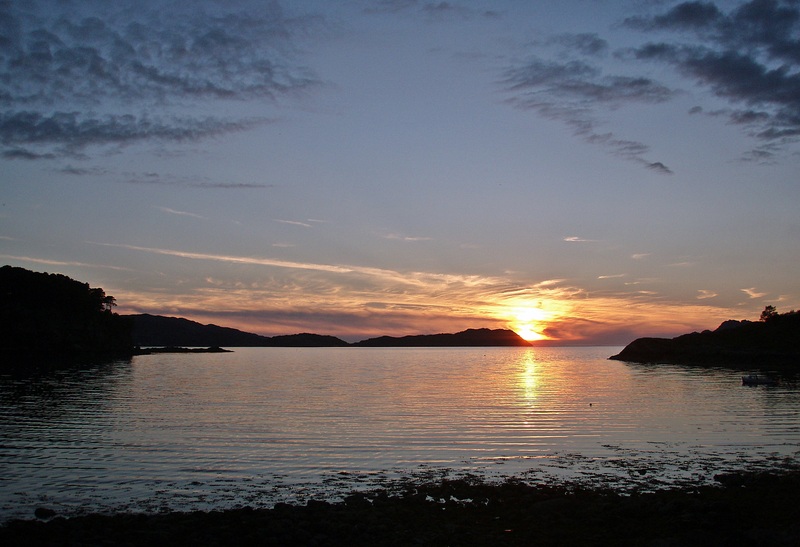 Back at the campsite in Shieldaig I was treated to a beautiful sunset, a fitting end to an exhausting but wonderful day. After a quick dinner in my tent I had a very good sleep that night. 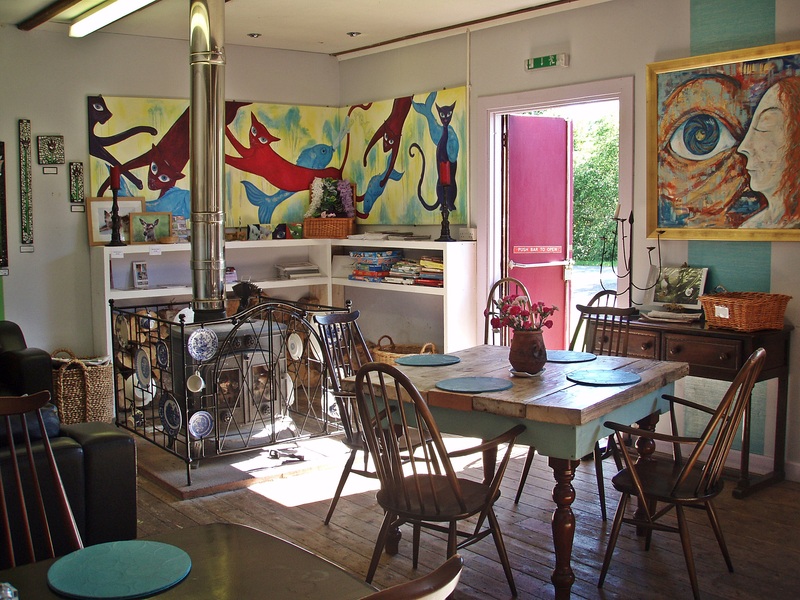 The next morning on the way home I visited the Whistle Stop Cafe in Kinlochewe for breakfast. 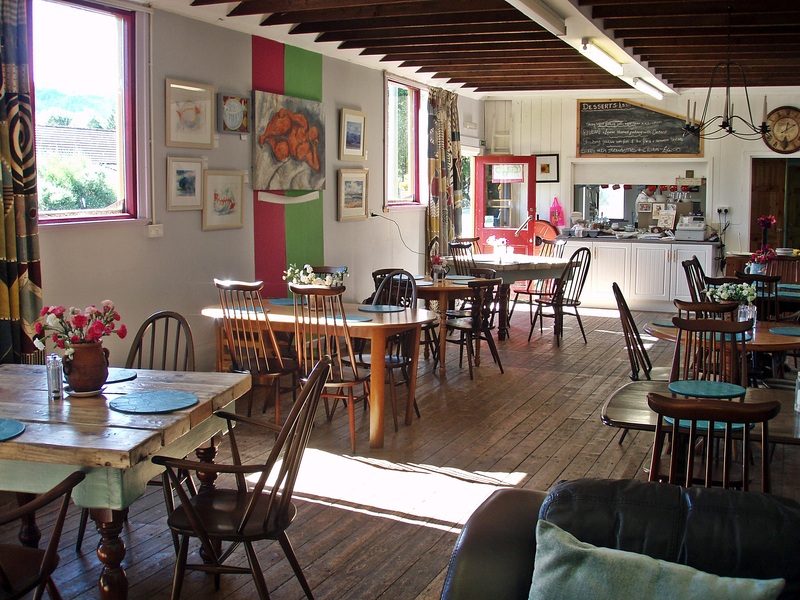 The photos were taken when the cafe had just opened, it became a lot busier later on! 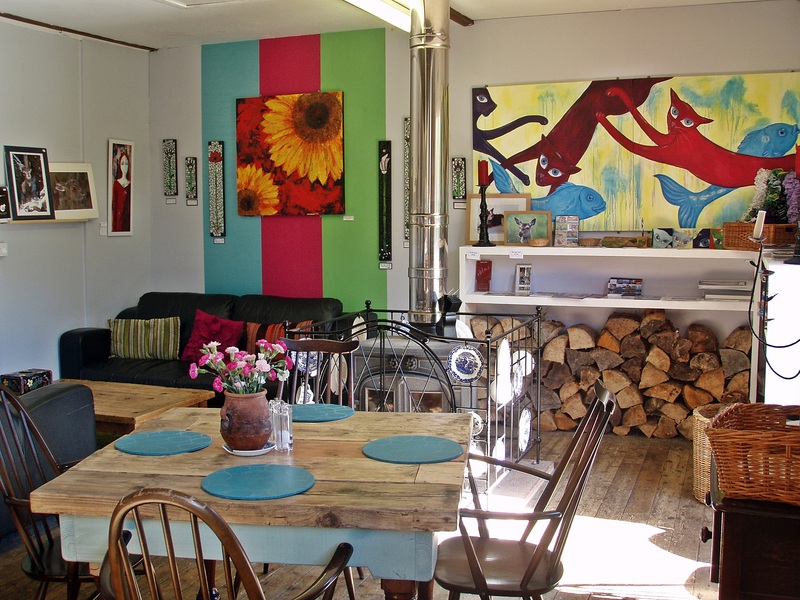 Friendly service, great food and a unique design – thoroughly recommended! Two fine but very long days. 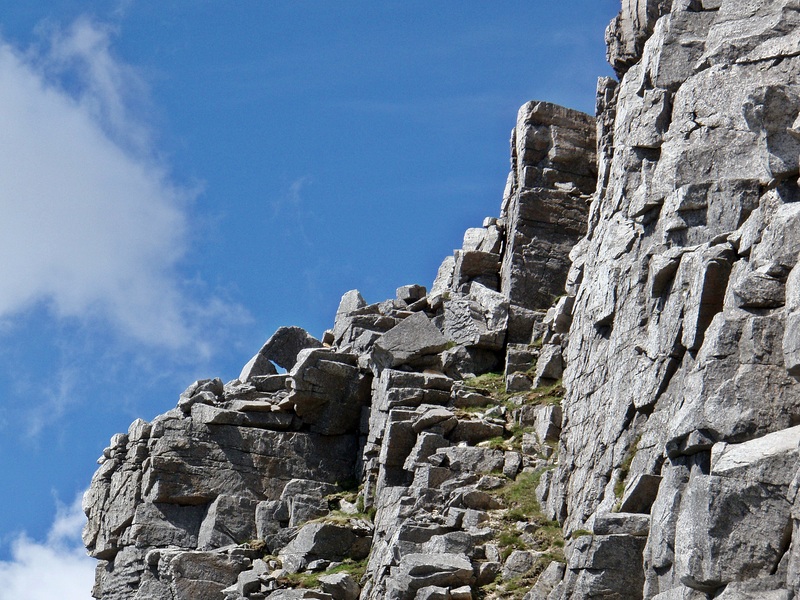 Exceptional photos capture the truly wonderful scenery. 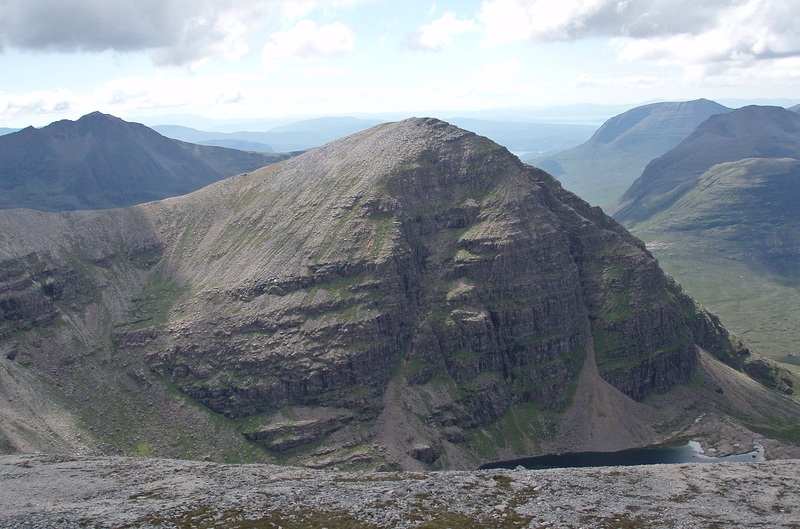 Must do the full traverse of Beinn Eighe sometime, looks like a classic. Many thanks for your comment! 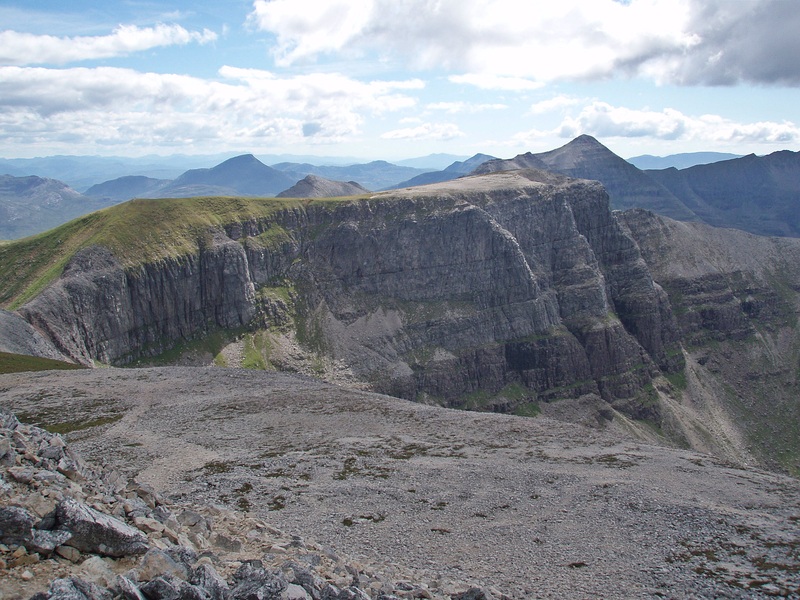 The “Big Three” in Torridon all provide great traverses, and the scenery is simply stunning. Lovely photos as usual. What an amazing couple of days. Thank you, it certainly was amazing, and apart from the cloud cover on the first day (which of course cleared later…), I was very lucky with the weather. 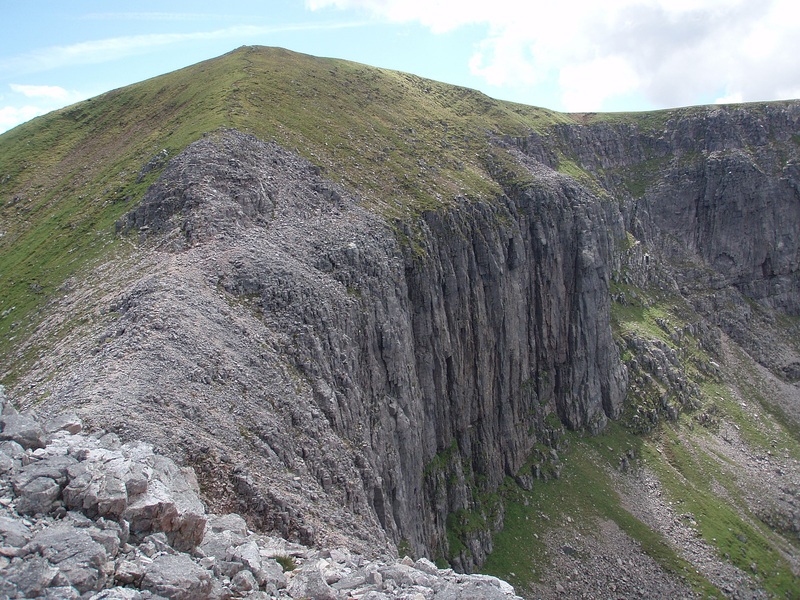 The Black Carls are not that bad, but if you should want to climb them I would suggest the traverse from N to S (starting from Kinlochewe). 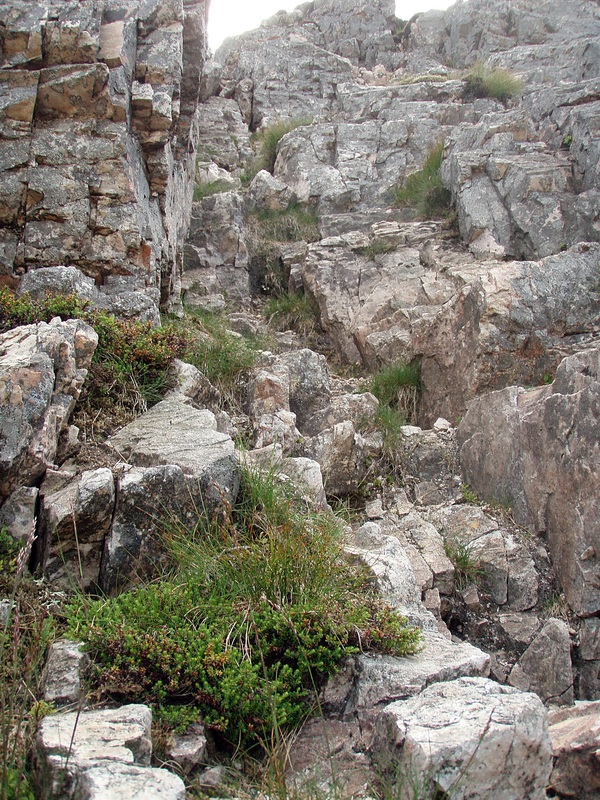 That way you could ascend the steep bits instead of downclimbing them, which would make it a little easier. Inspiring post. 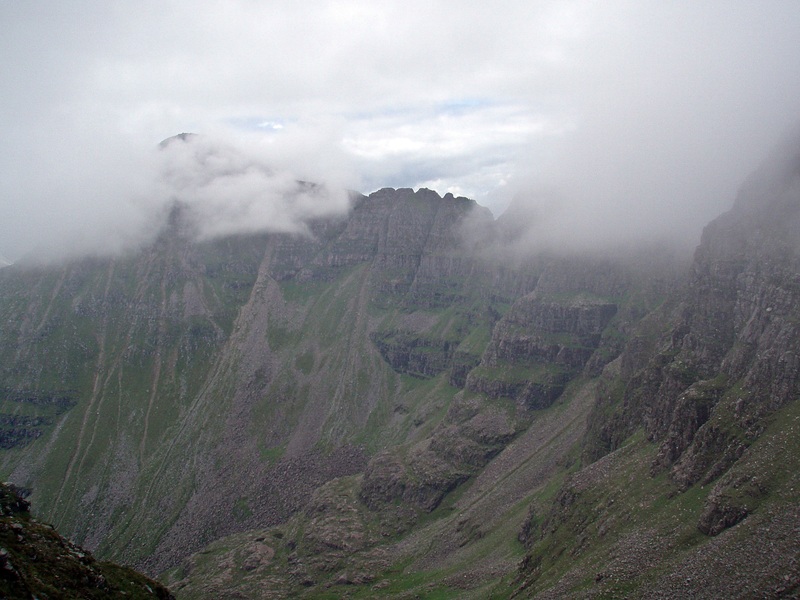 I’m not sure i have a head for those heights any more. But it would be fun to find out. Great photo’s.